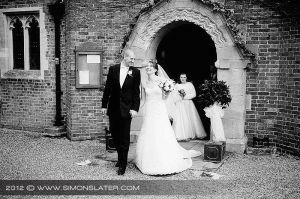 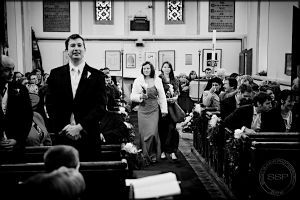 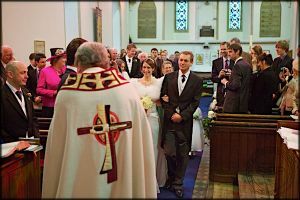 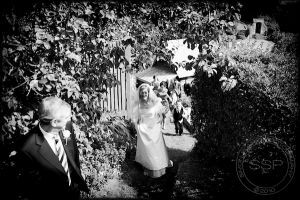 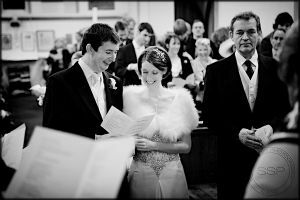 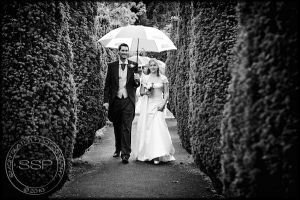 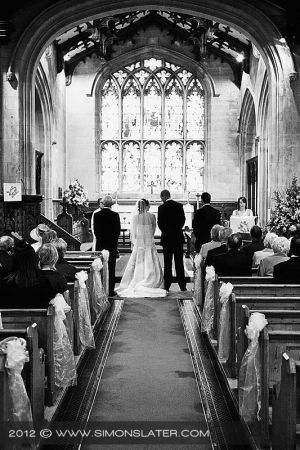 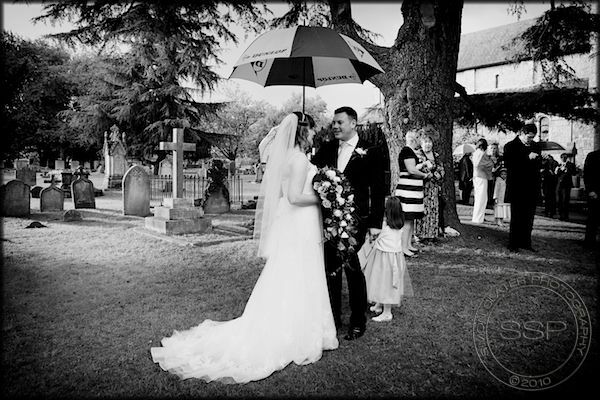 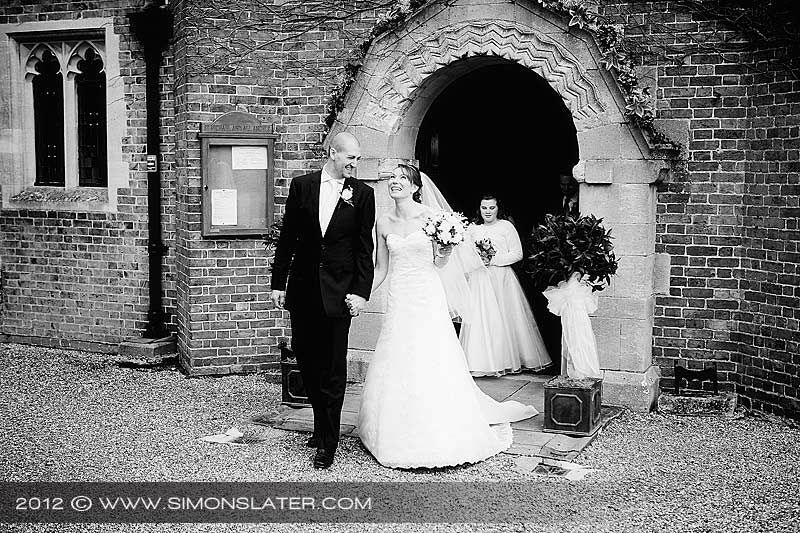 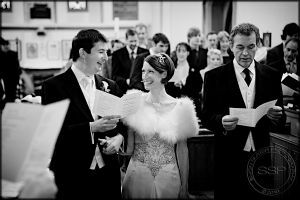 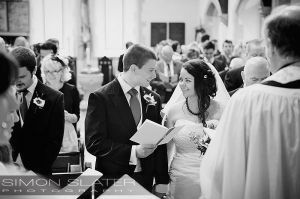 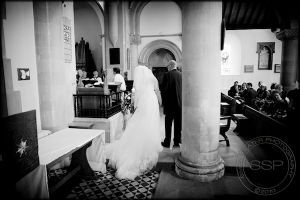 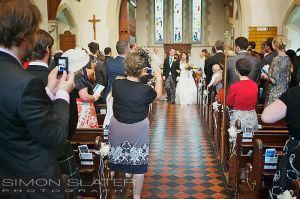 At the beginning of September I had he pleasure of photographing Sue and Tom’s wedding at St. James’s Church in Rowledge, Surrey. 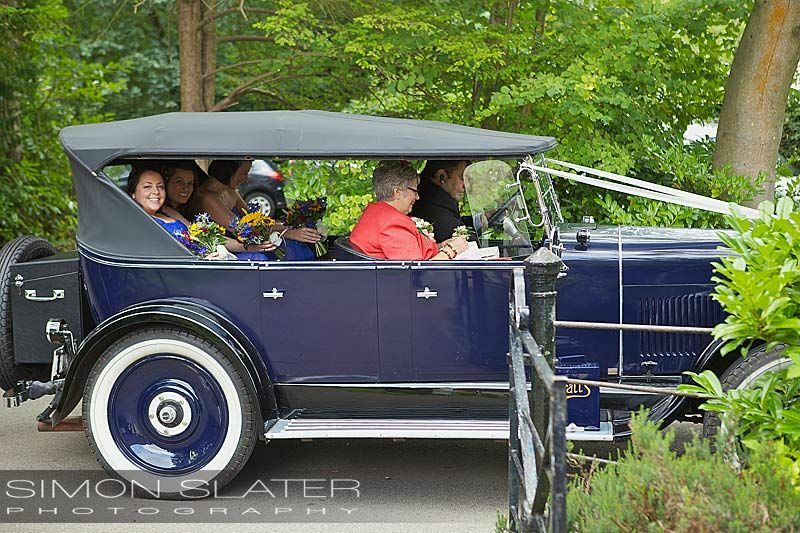 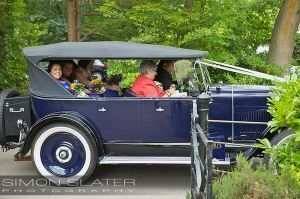 Sue arrived at the church with her father in an open sided dark blue 1924 Oakland called ‘Maude’, one of a kind in this country. 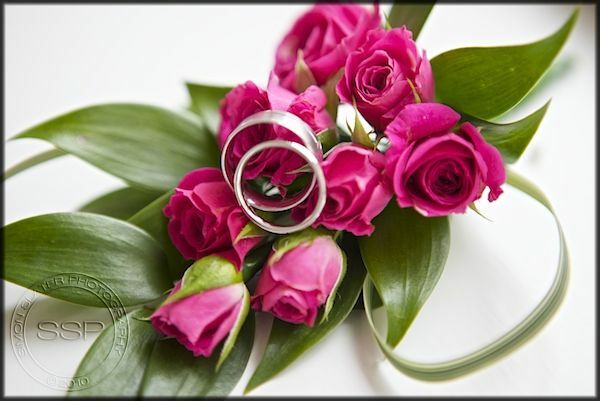 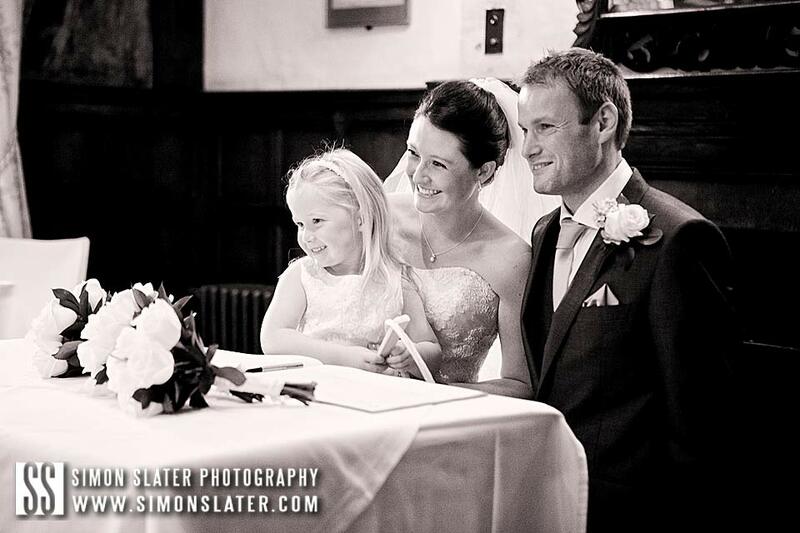 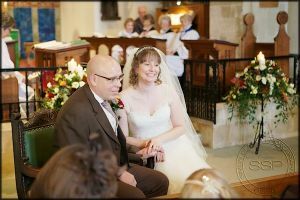 Sue and Tom were married in the church by 13:30 hrs, Congratulations again to Mr & Mrs Law. 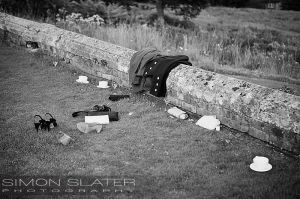 The bride and groom, wedding party, family and friends then all made their way a short distance down the road to Frensham Heights in Rowledge, Surrey for a champagne reception on the stunning lawns overlooking the Surrey countryside. 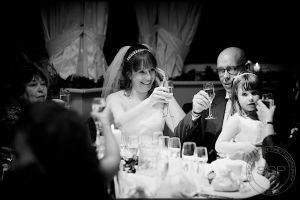 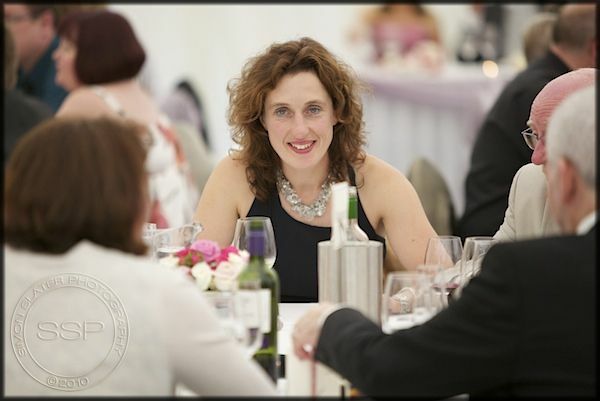 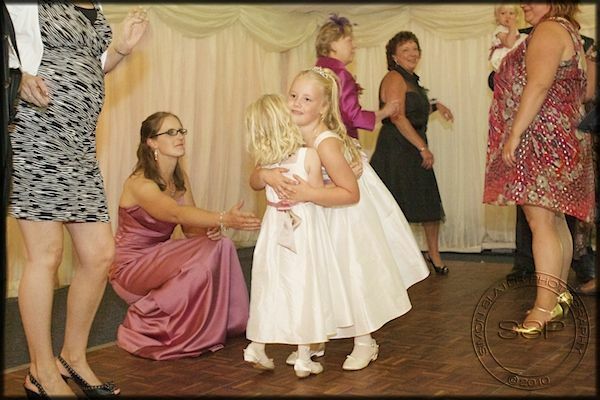 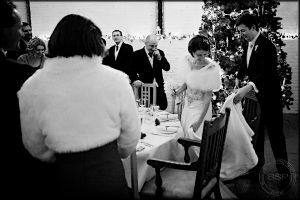 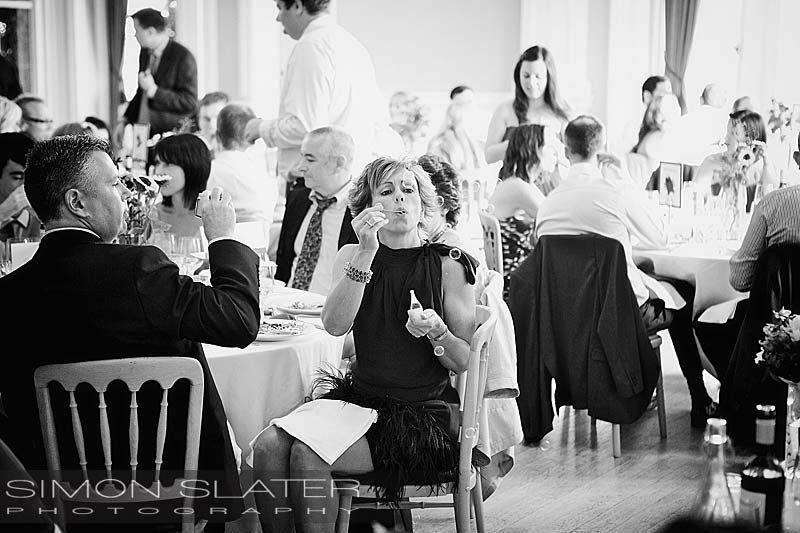 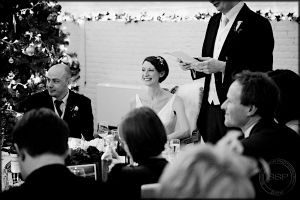 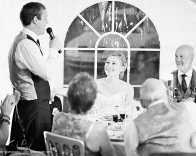 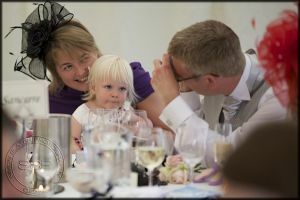 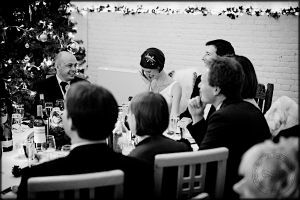 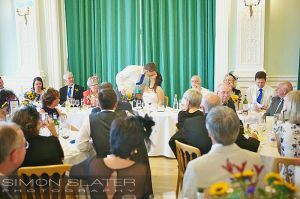 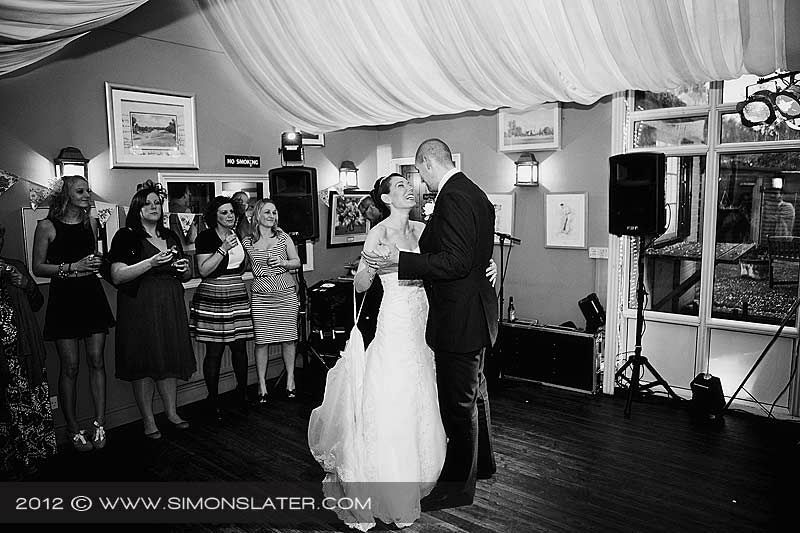 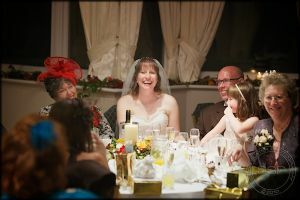 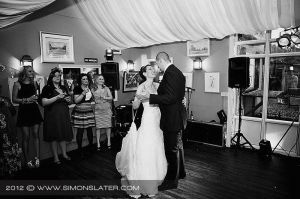 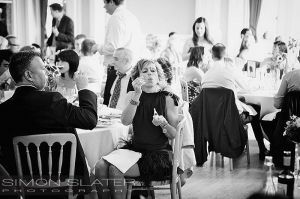 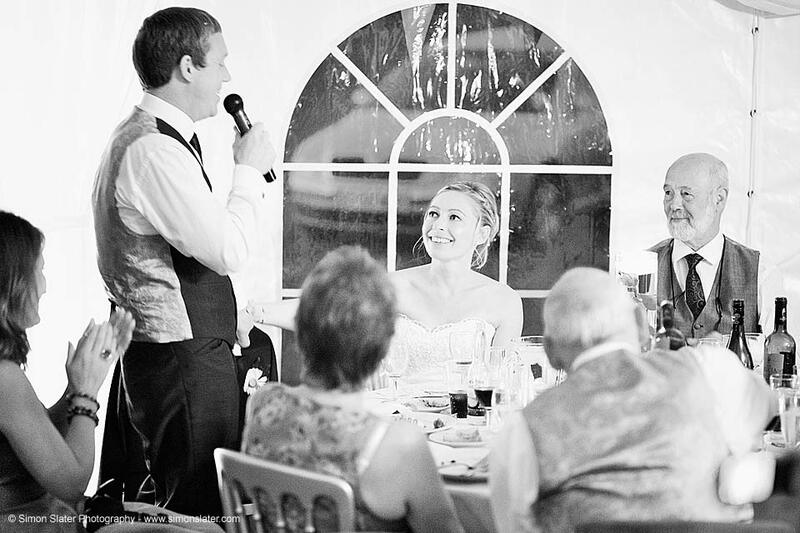 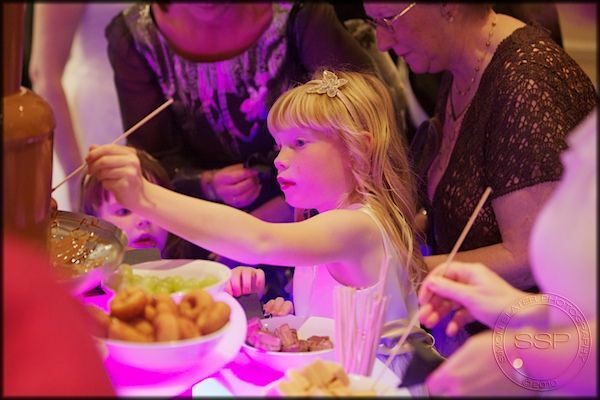 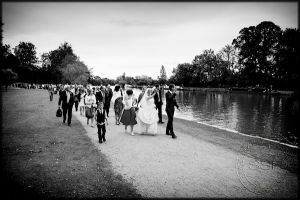 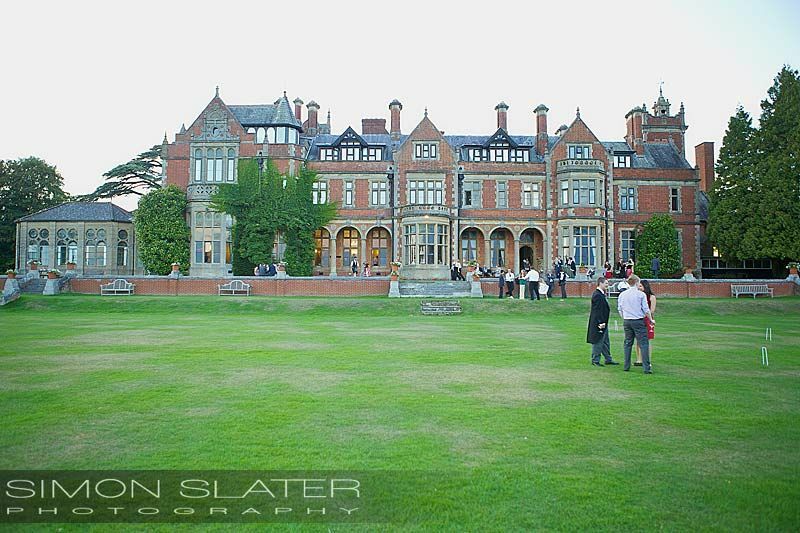 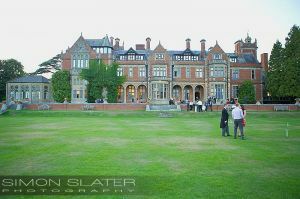 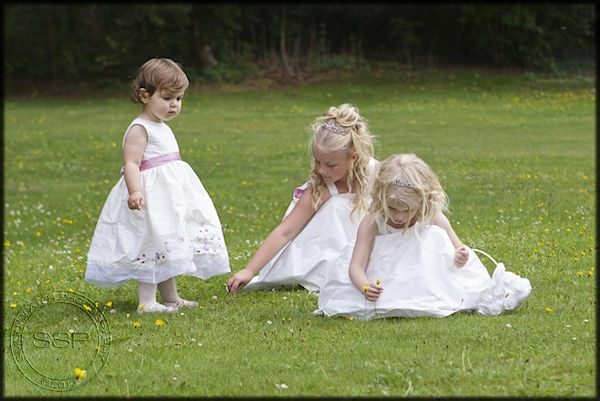 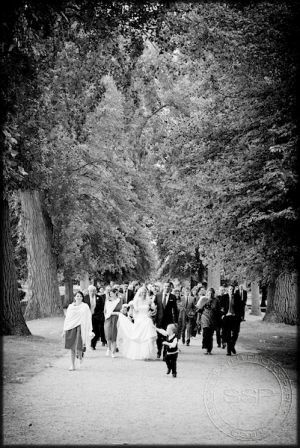 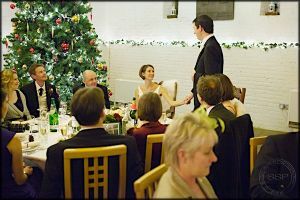 The wedding reception, speeches, cutting off the cake, first dance and evening celebrations were all held at Frensham Heights. 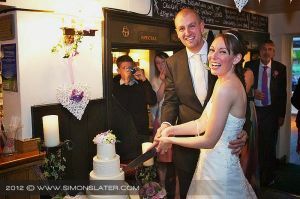 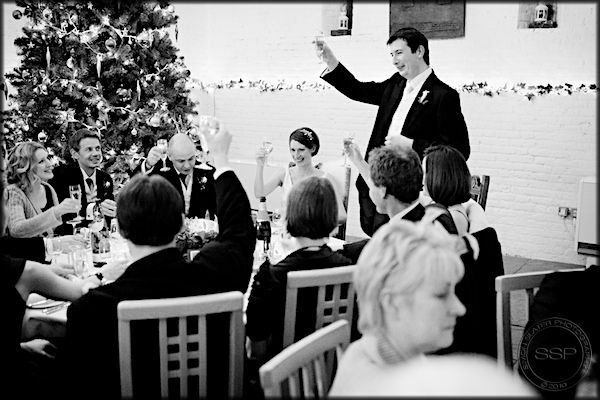 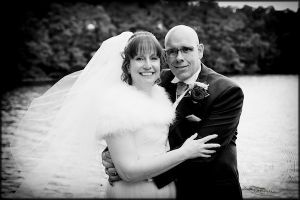 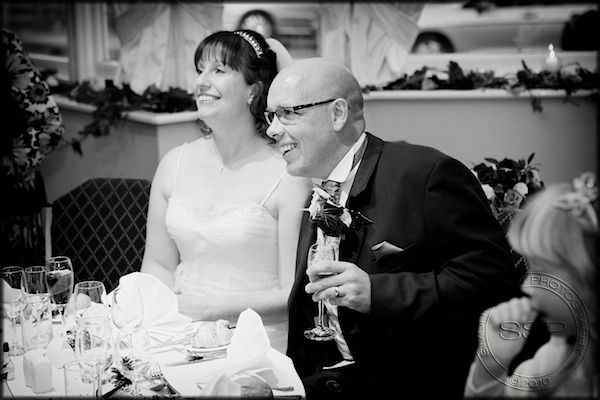 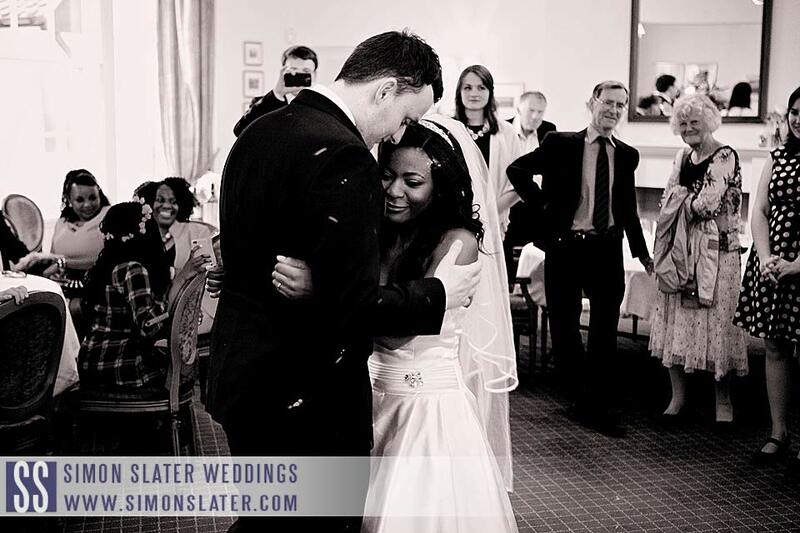 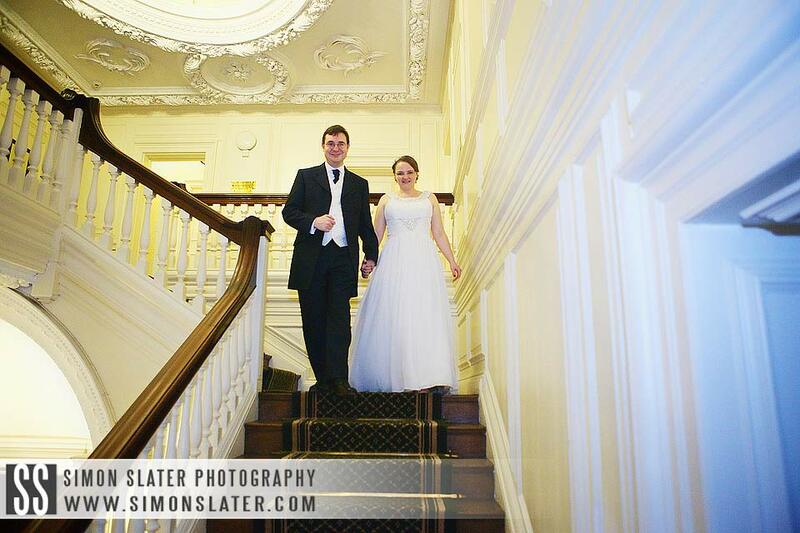 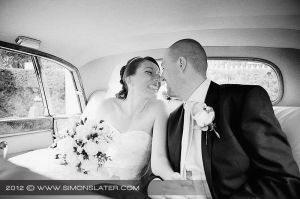 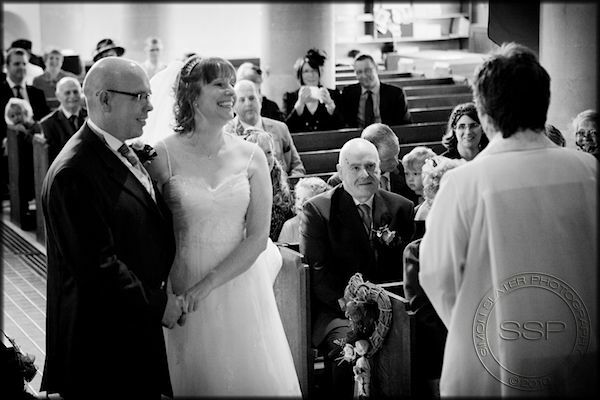 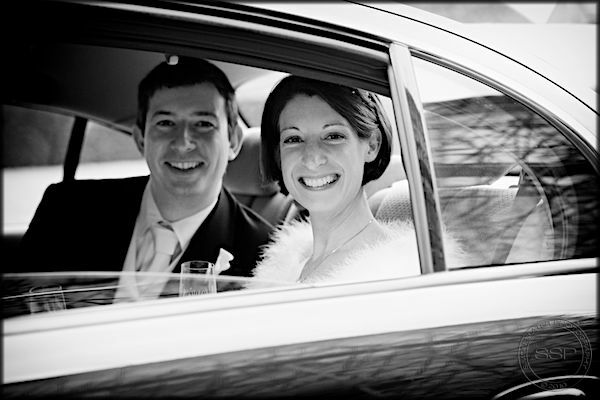 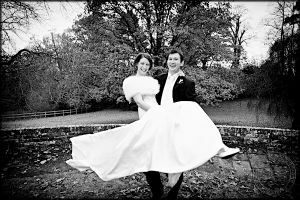 Congratulations again to Mr & Mrs McGill, married on Saturday 11th December, 2010. 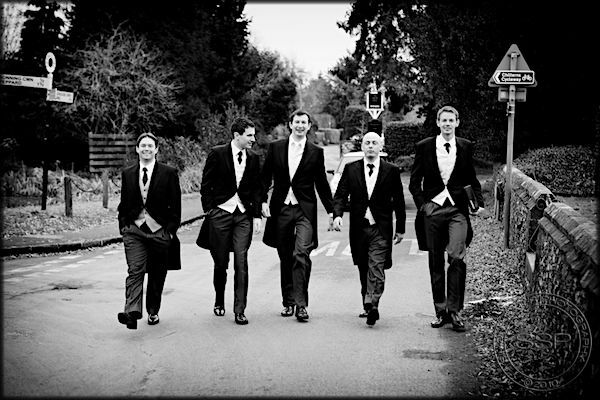 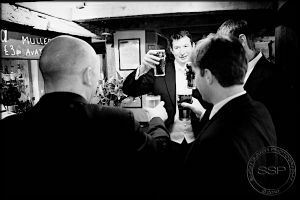 I arrived to find a slightly nervous but calm groom, best man and ushers at the pub around the corner from the church before the ceremony. 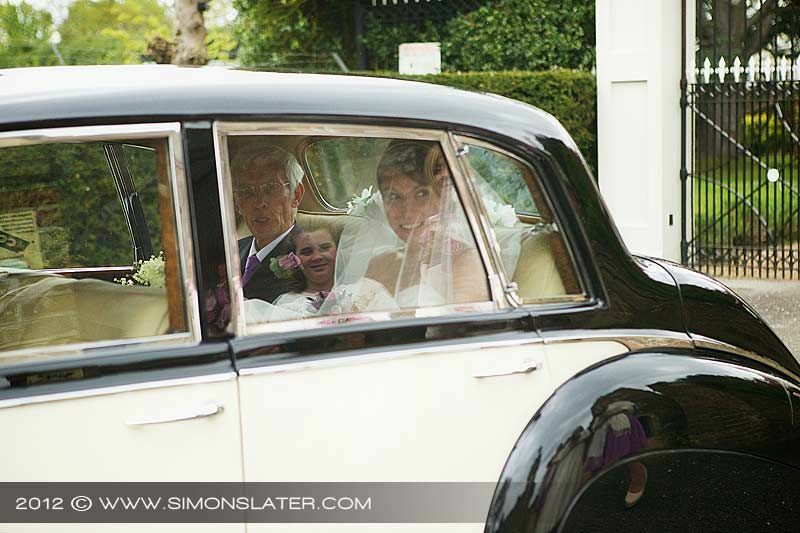 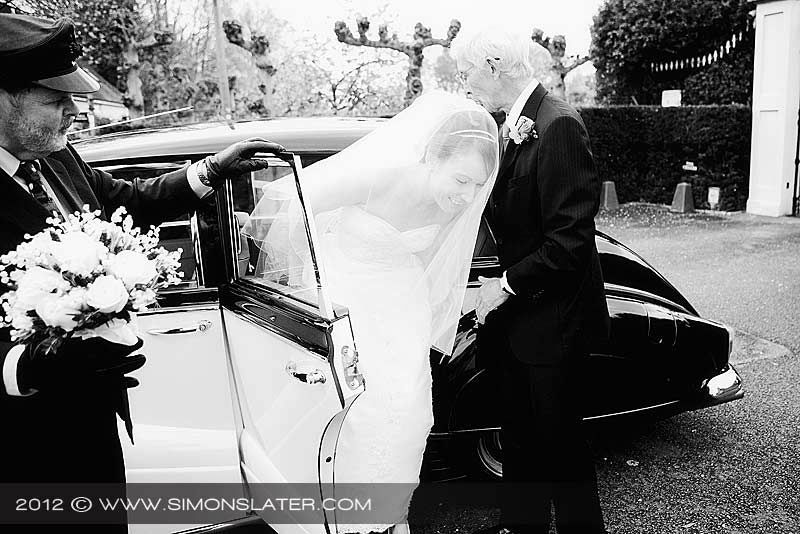 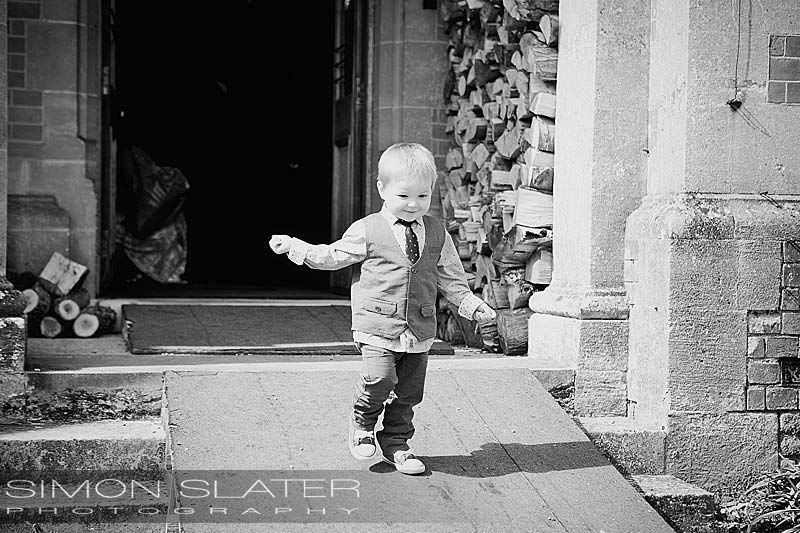 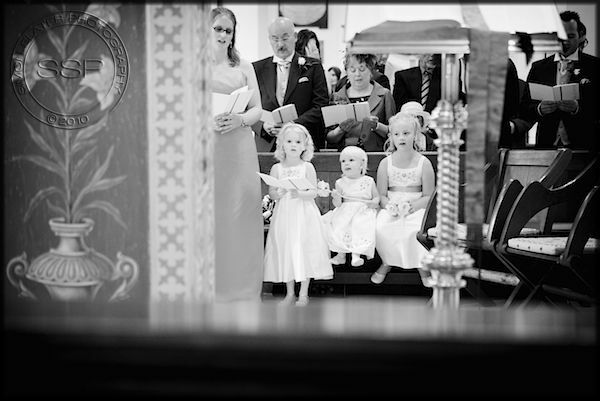 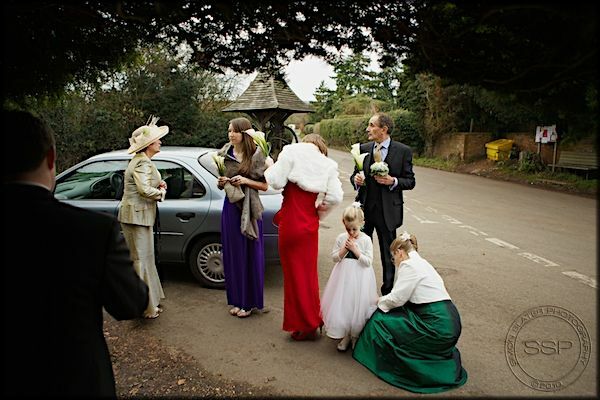 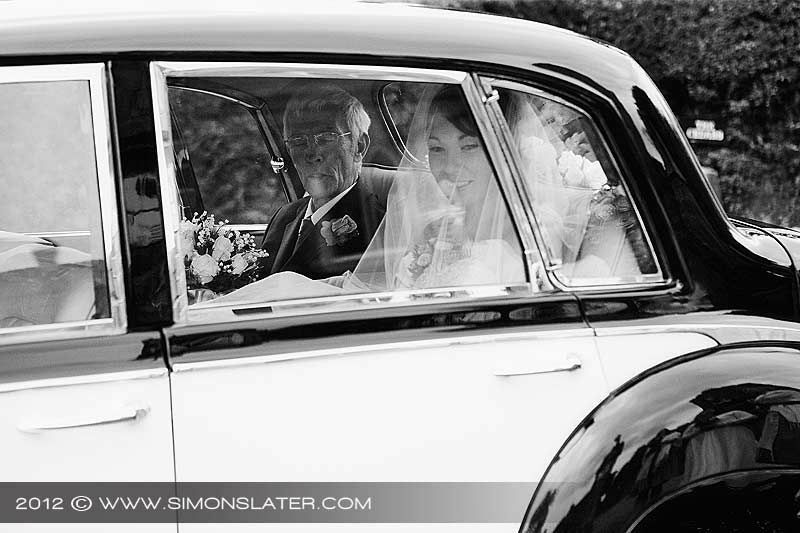 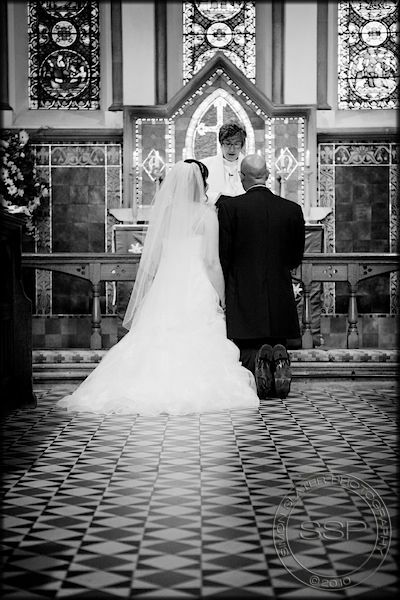 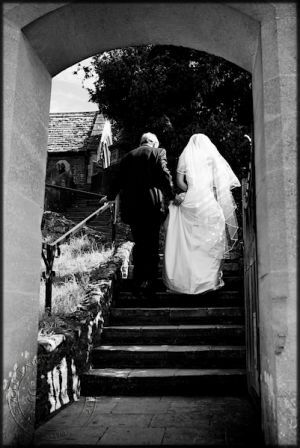 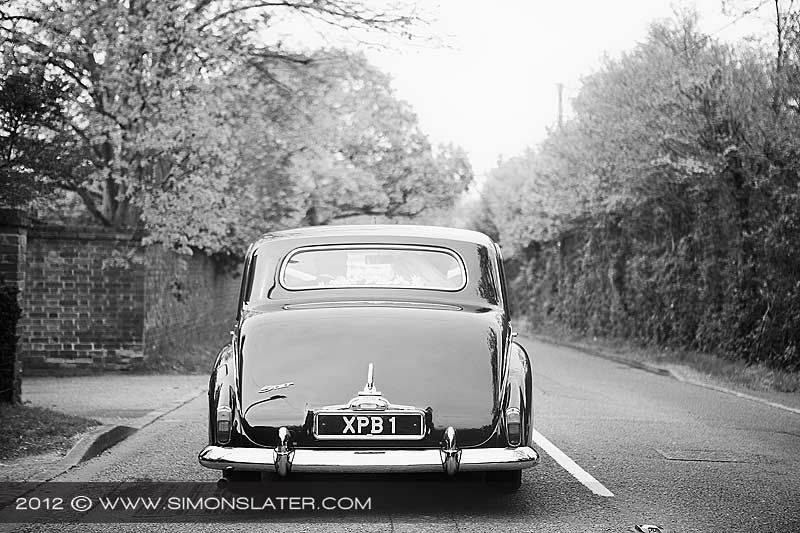 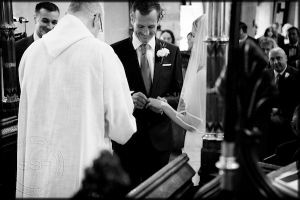 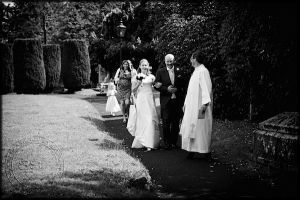 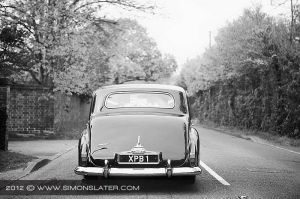 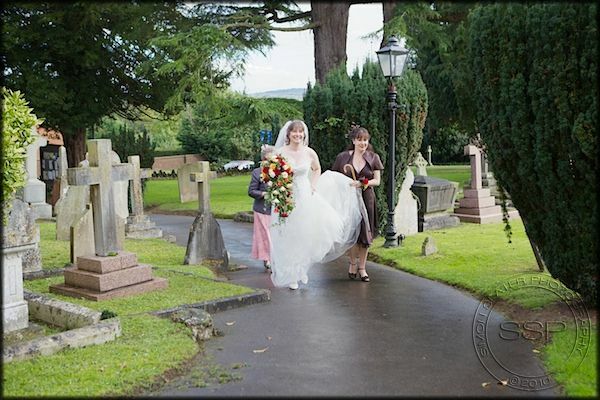 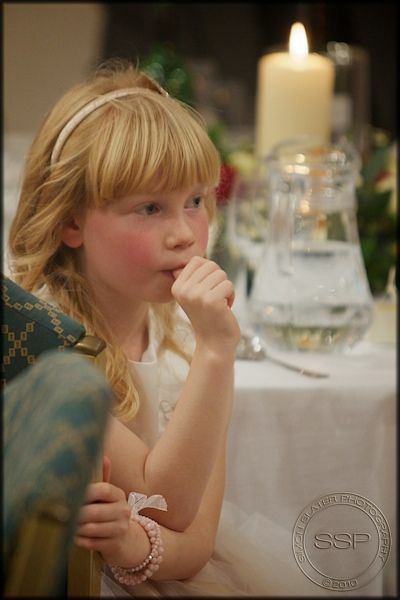 Sophie was driven to the church by her father in his beautifully polished S’ Type Jaguar. 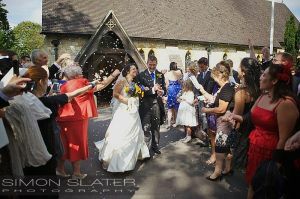 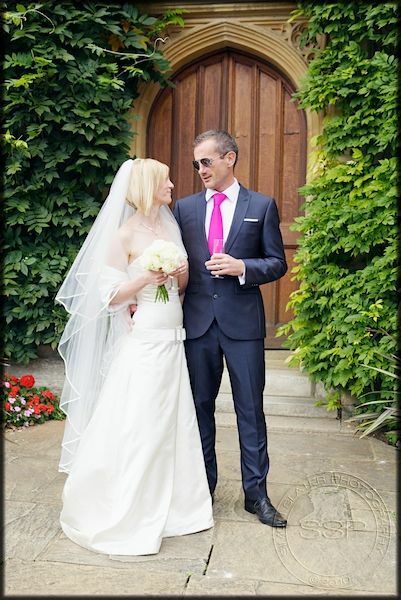 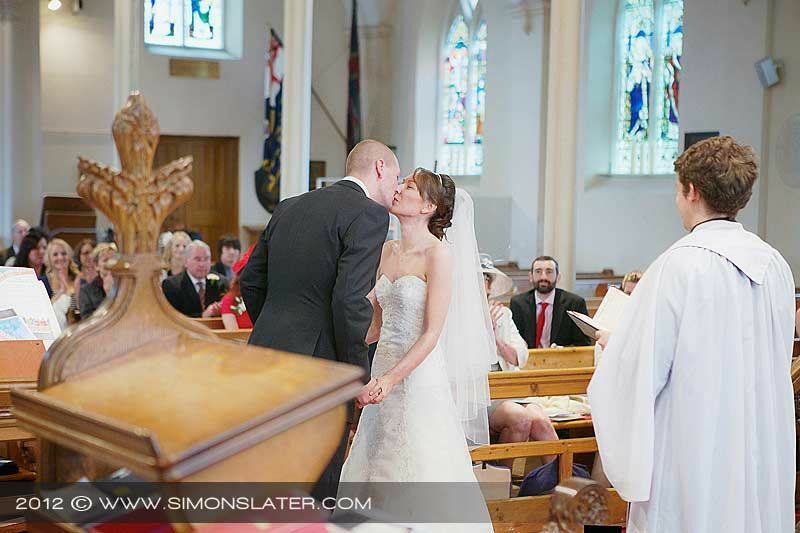 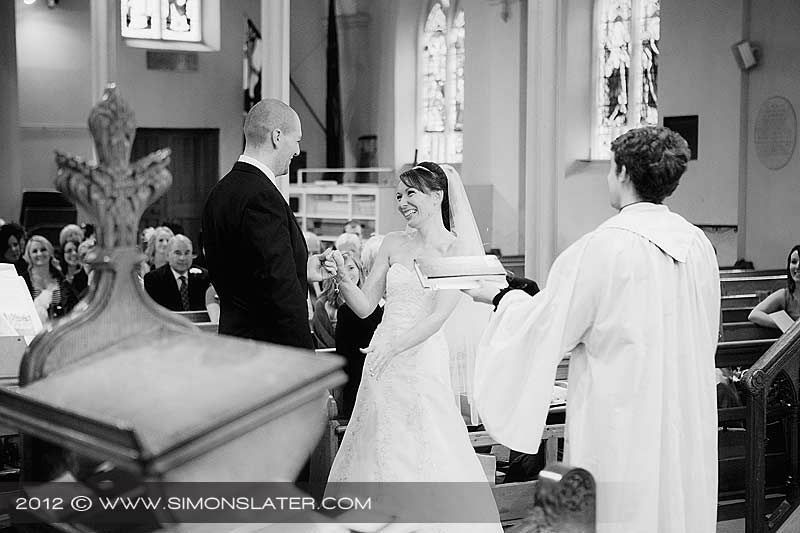 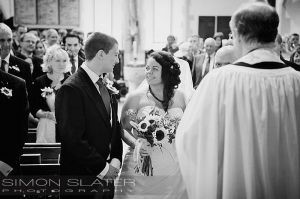 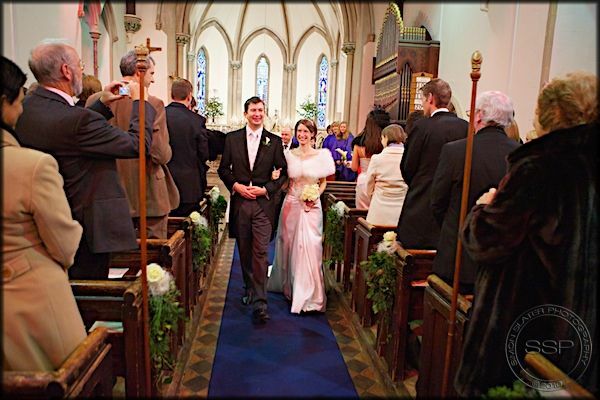 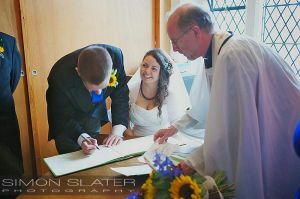 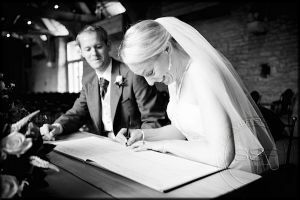 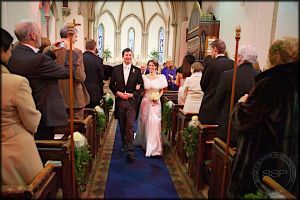 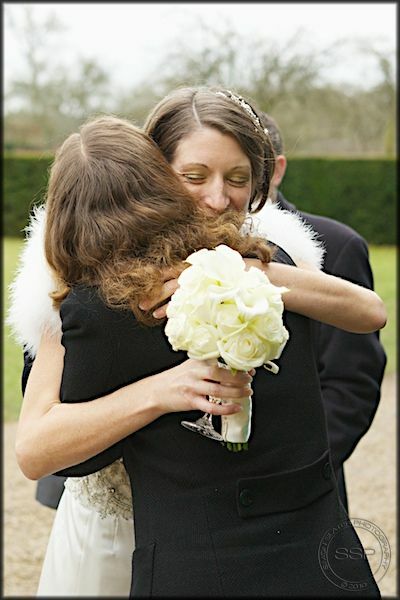 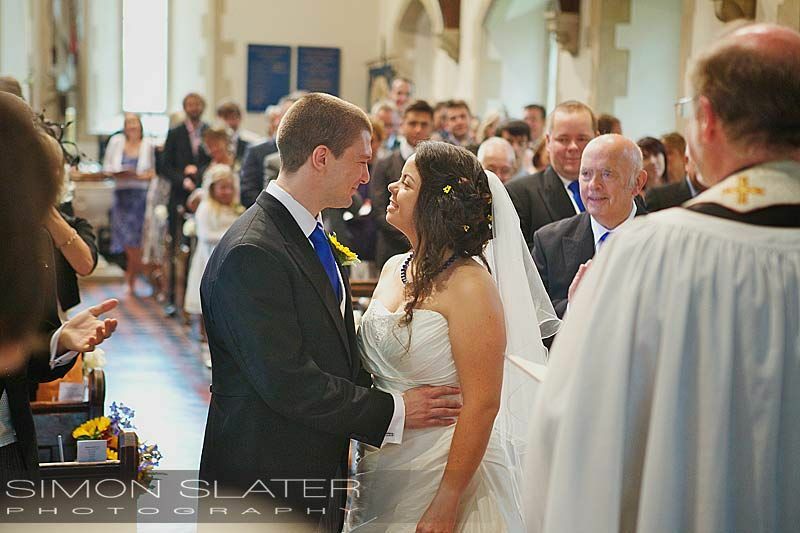 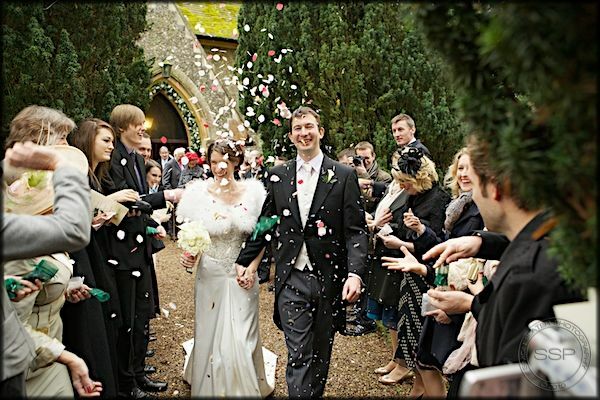 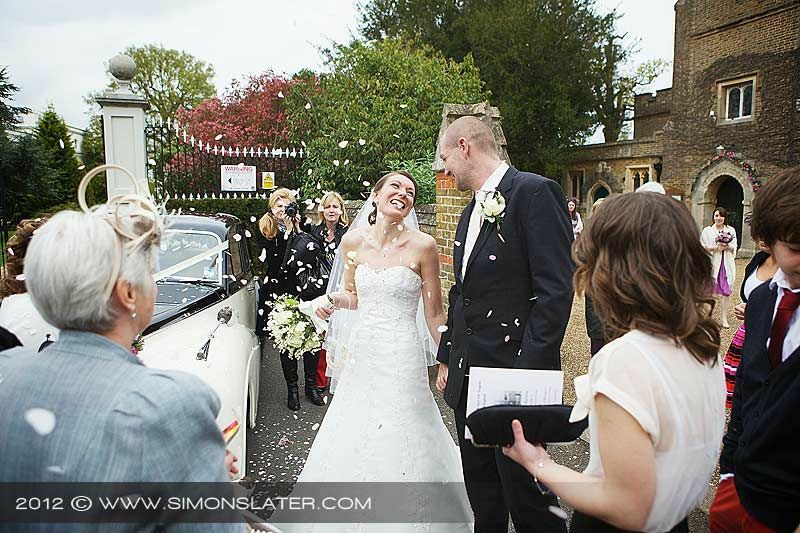 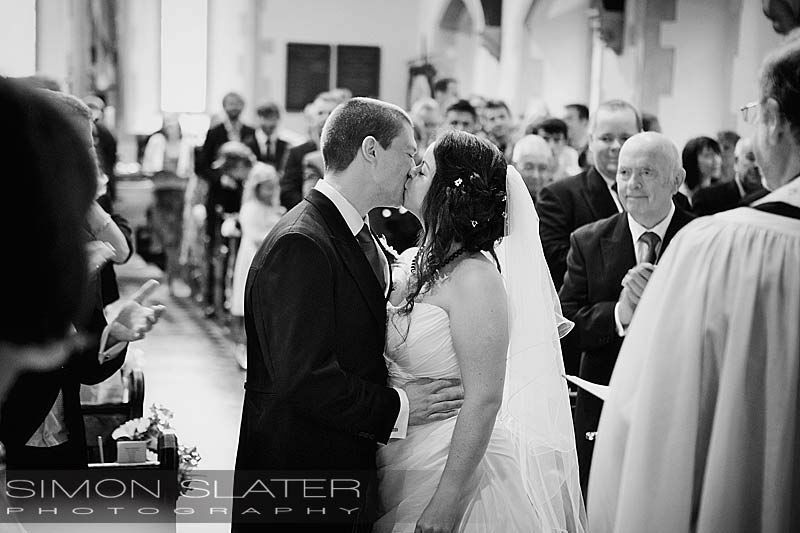 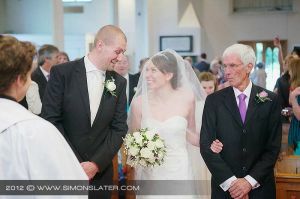 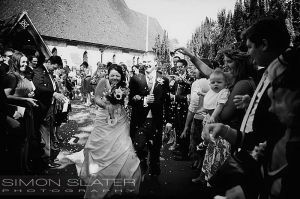 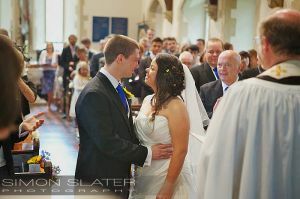 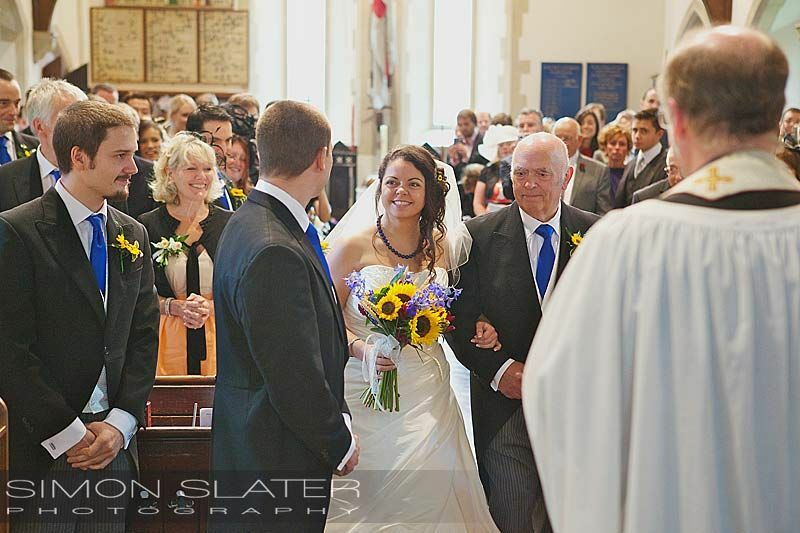 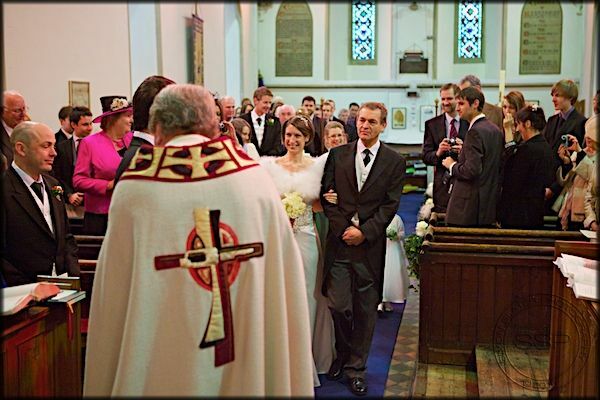 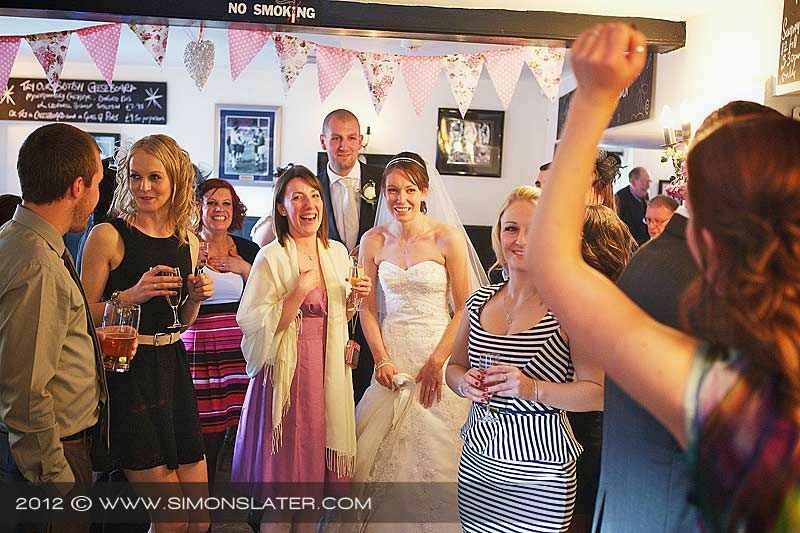 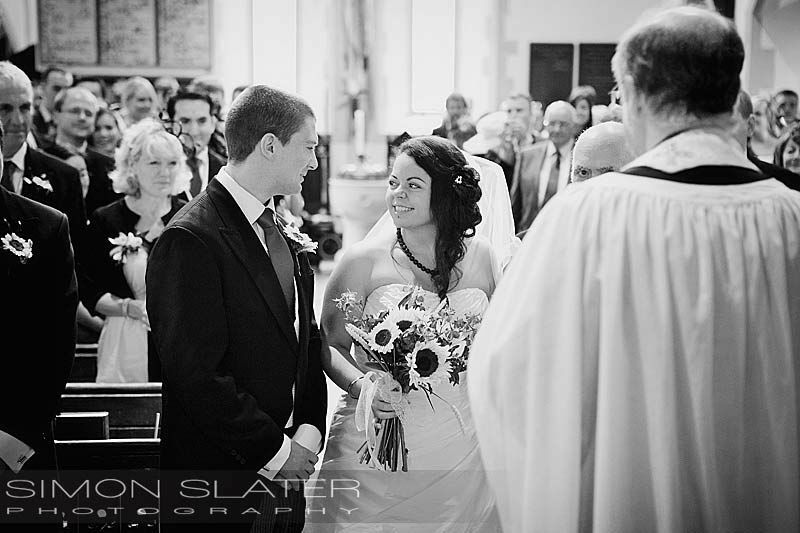 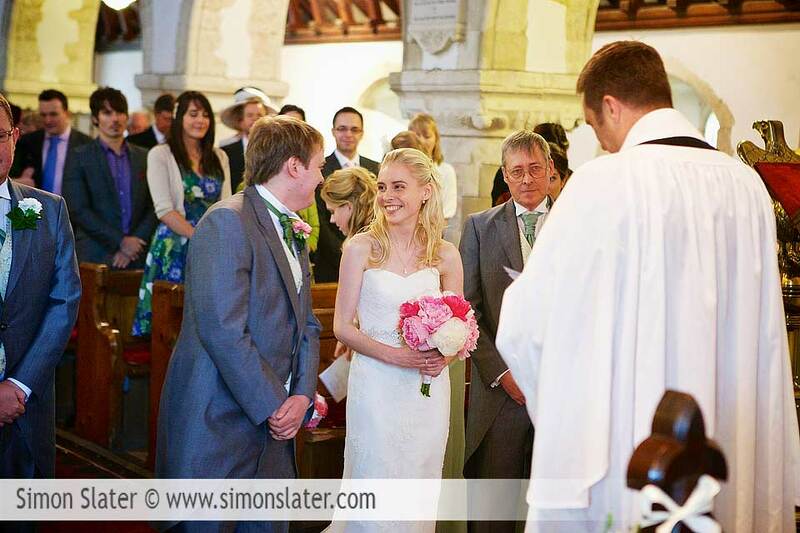 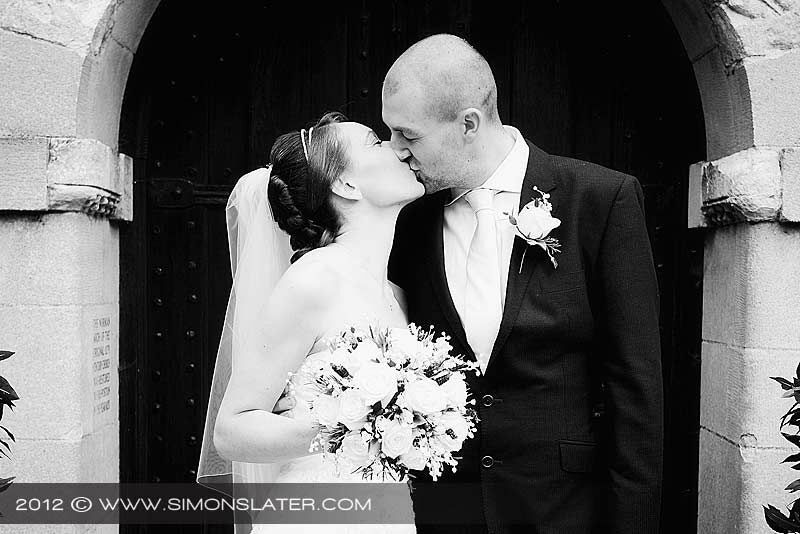 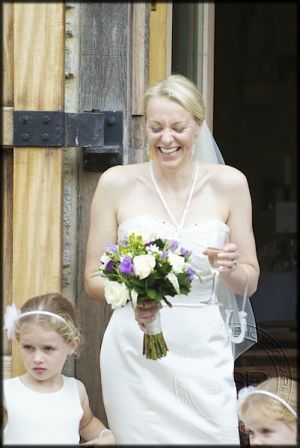 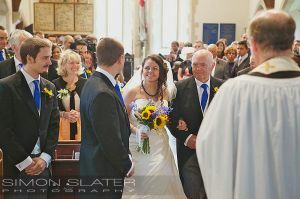 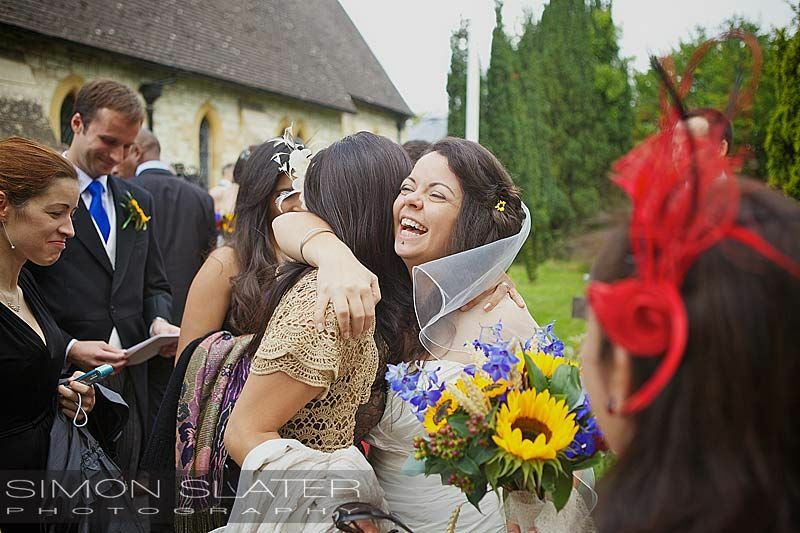 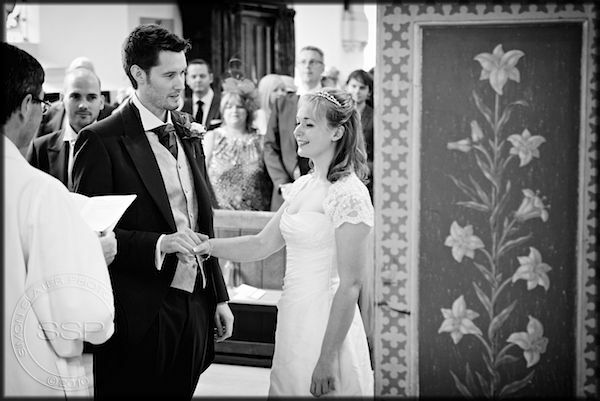 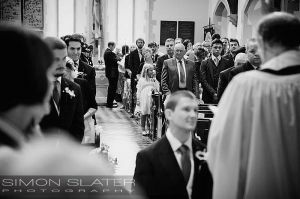 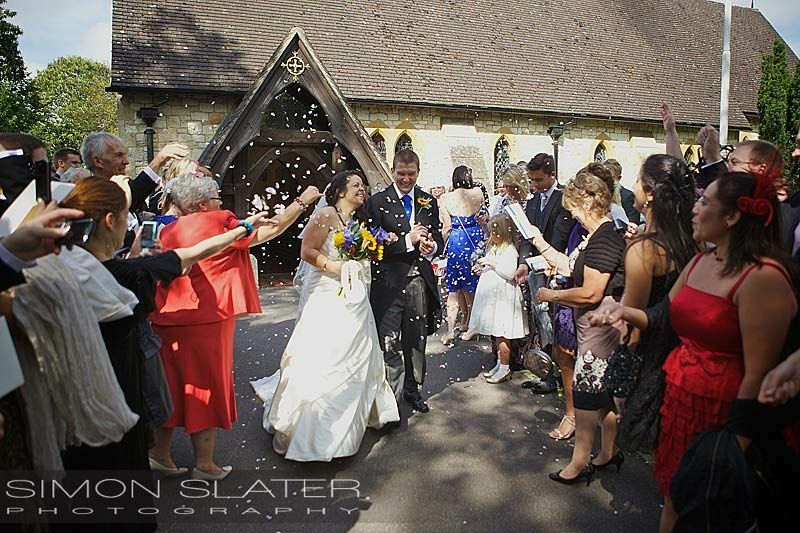 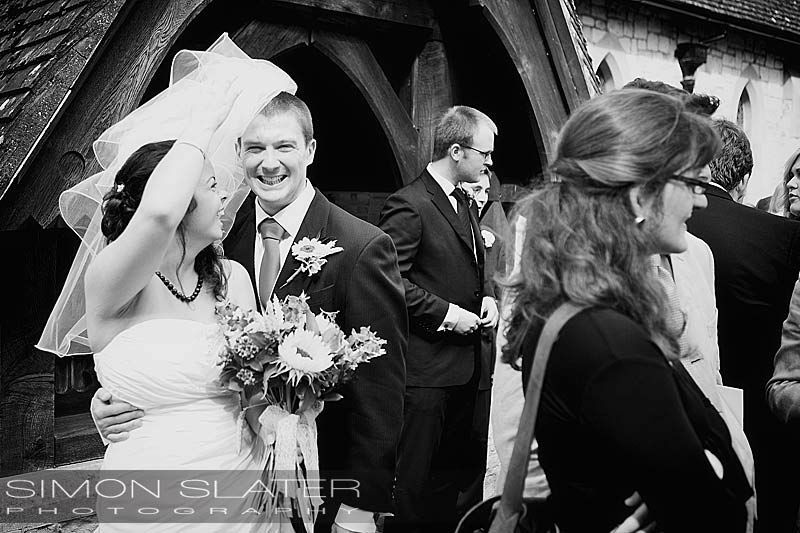 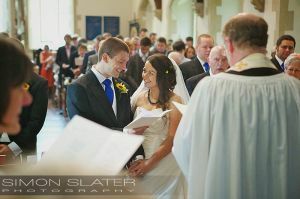 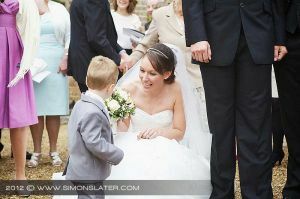 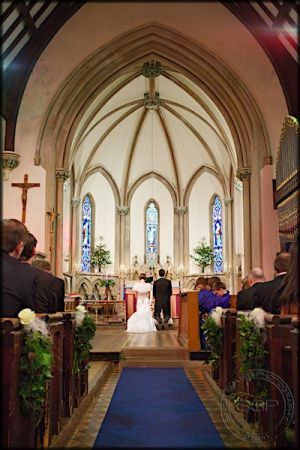 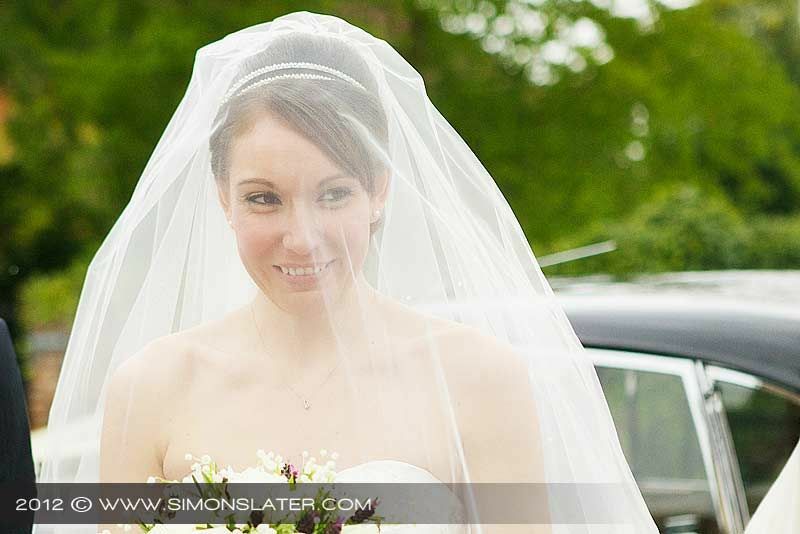 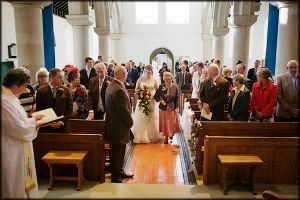 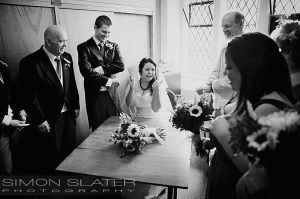 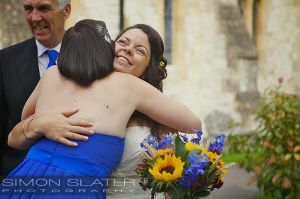 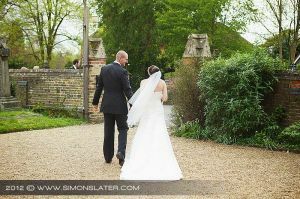 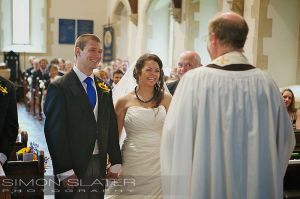 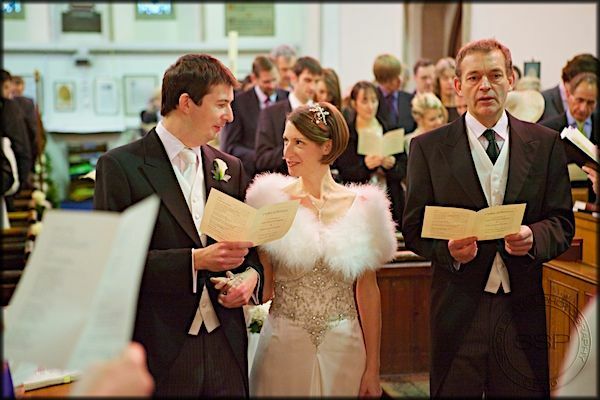 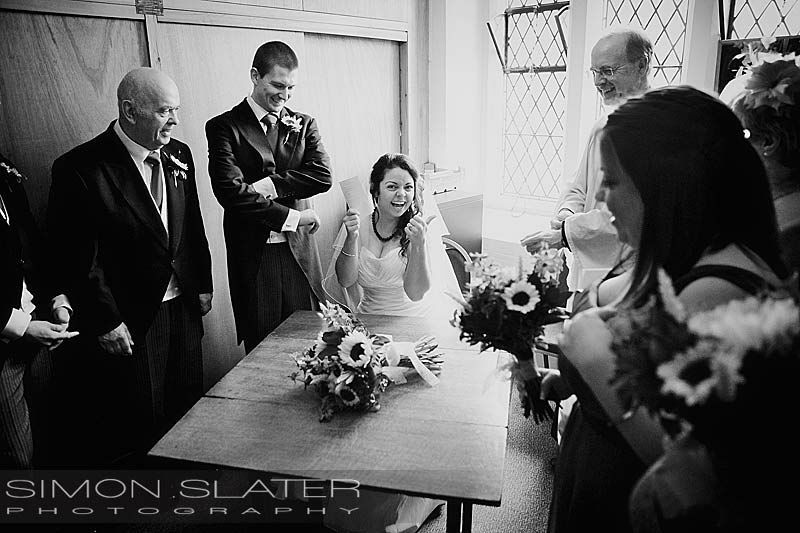 Sophie and Rainer were then married in St. John the Baptist’s church in Kidmore End, Oxfordshire at 1400hrs. 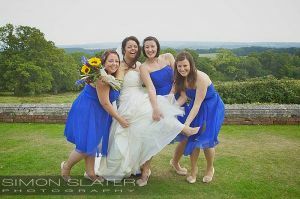 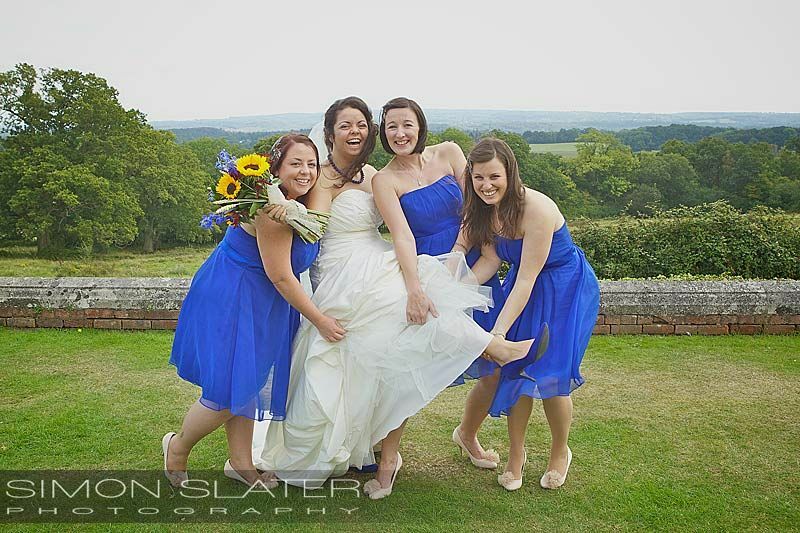 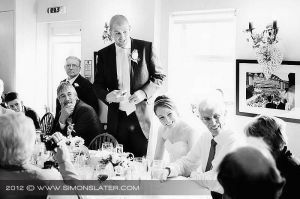 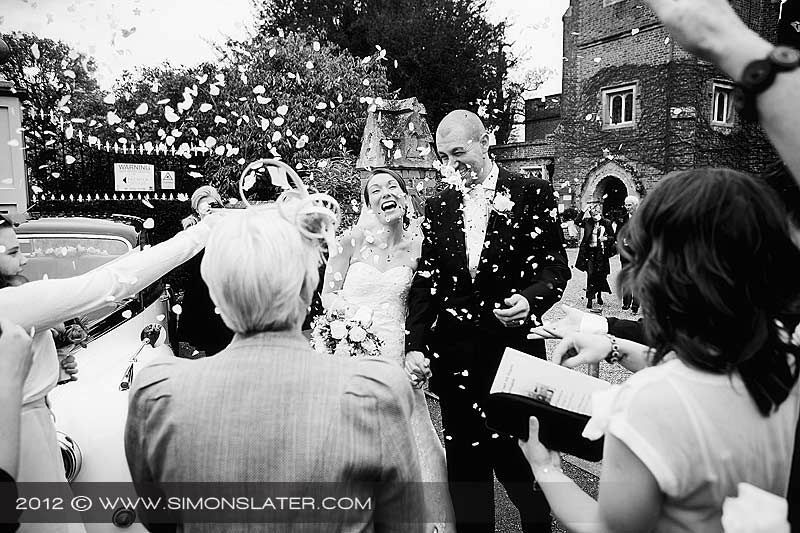 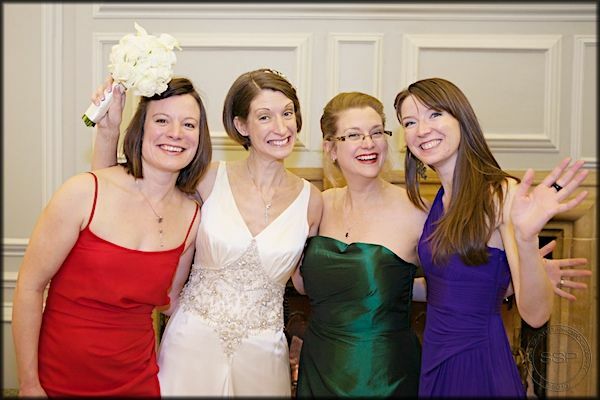 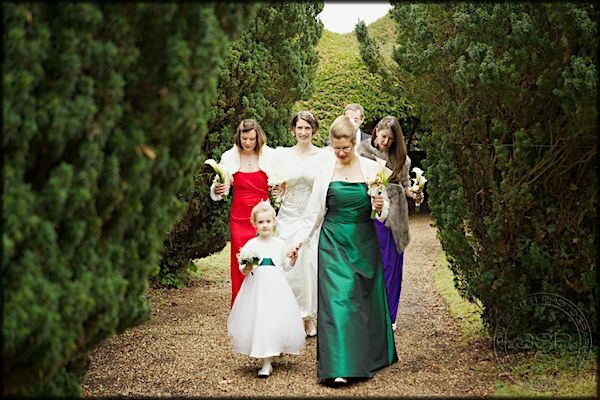 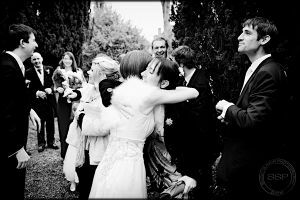 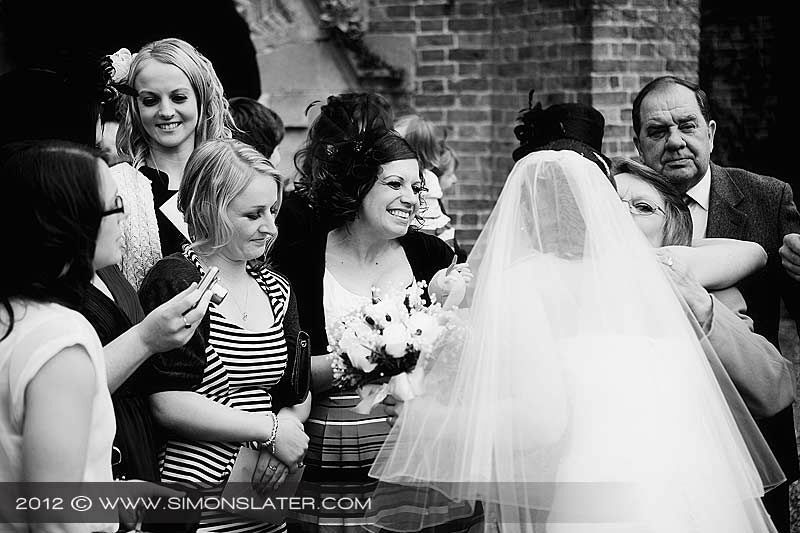 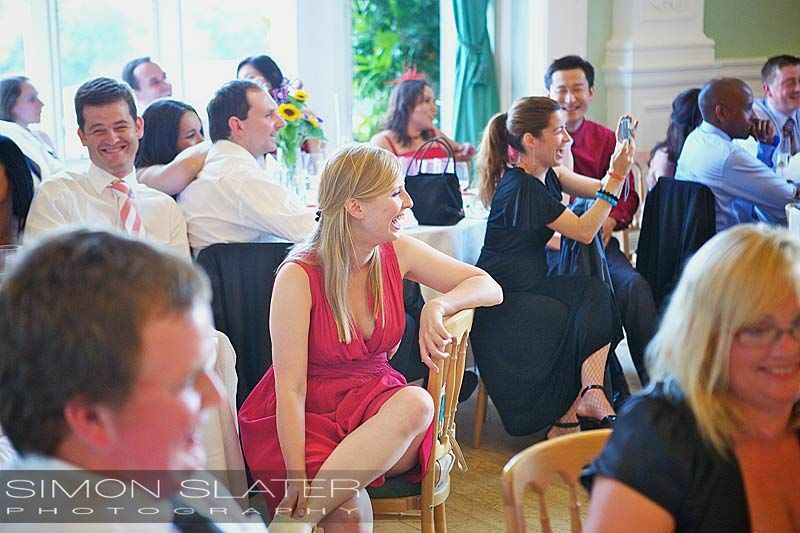 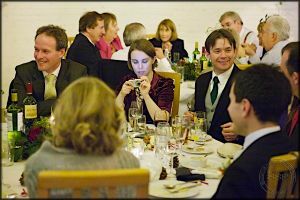 The wedding party then moved to Ufton Court, a beautiful Elizabethan Manor House set in stunning grounds near Reading, Berkshire. 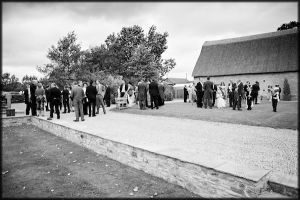 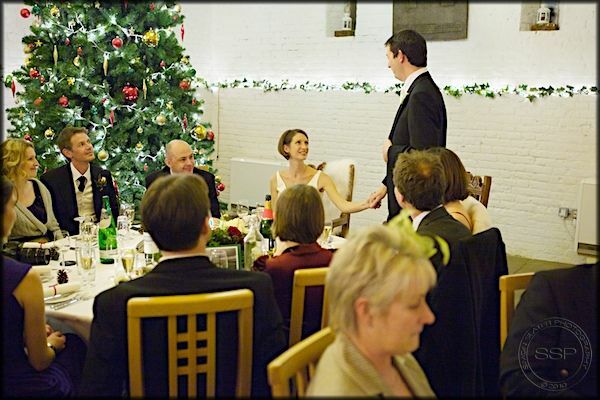 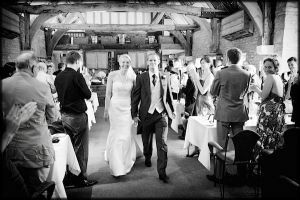 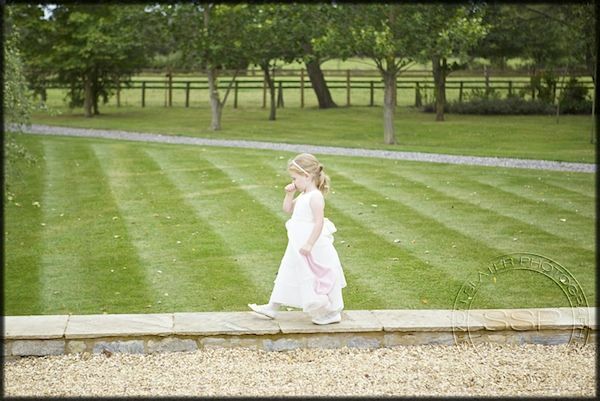 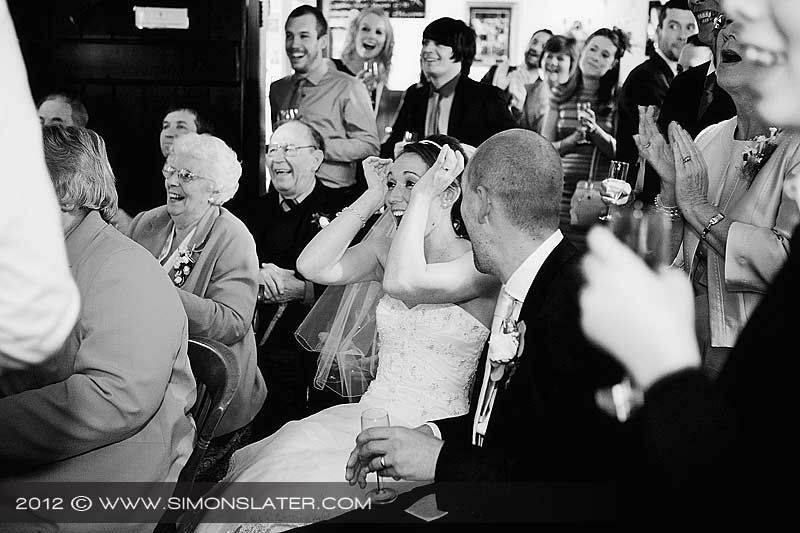 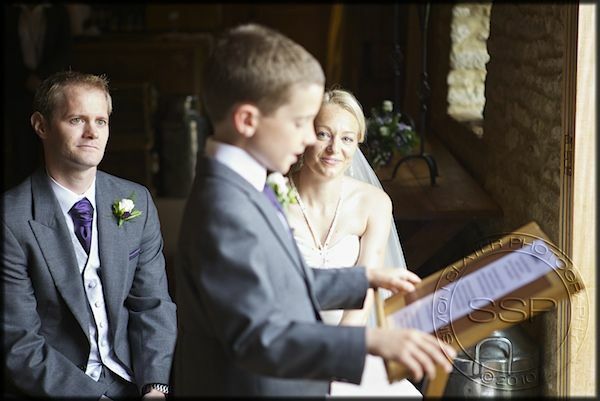 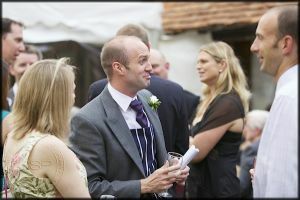 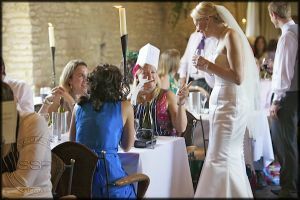 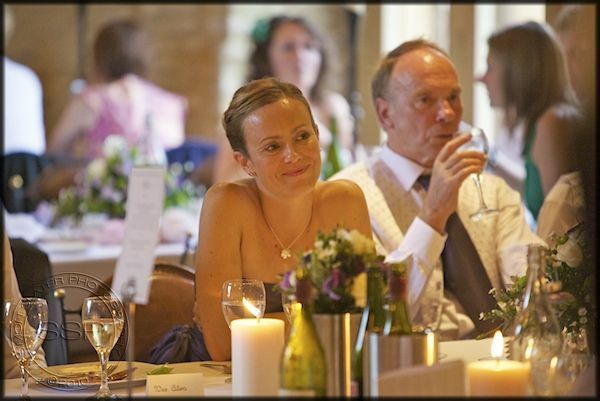 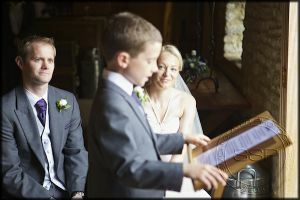 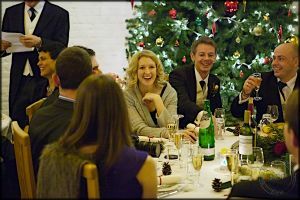 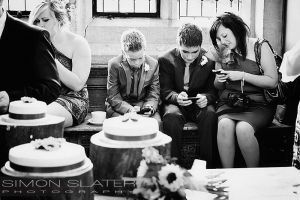 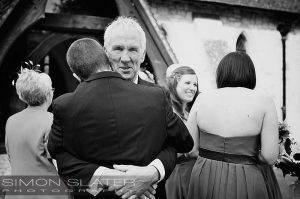 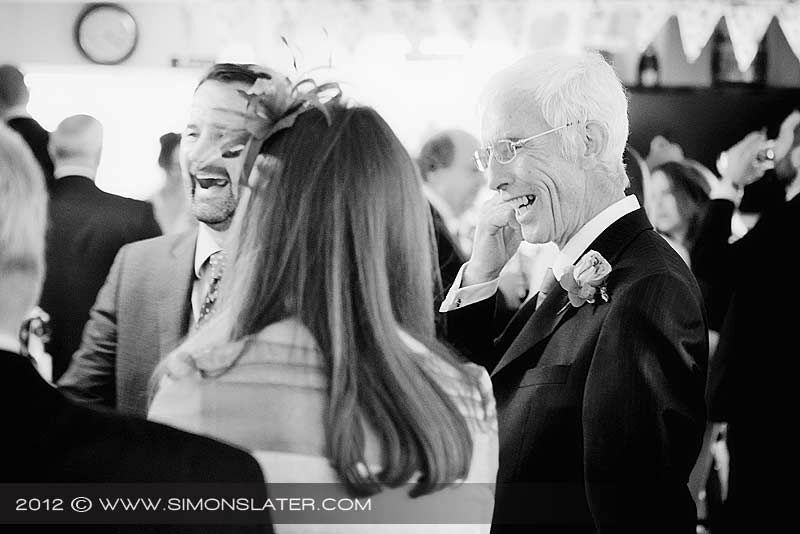 The speeches, wedding breakfast, barn dance and evening celebrations were all held in the magnificent Ufton Court barn. 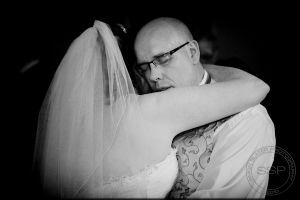 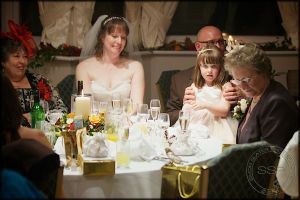 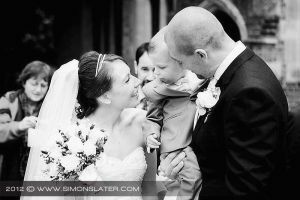 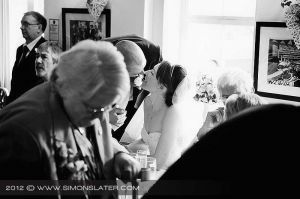 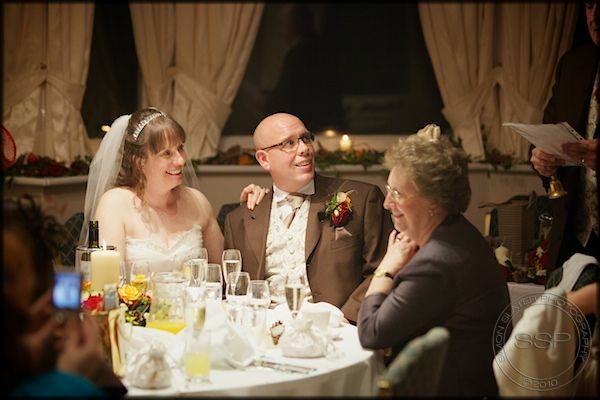 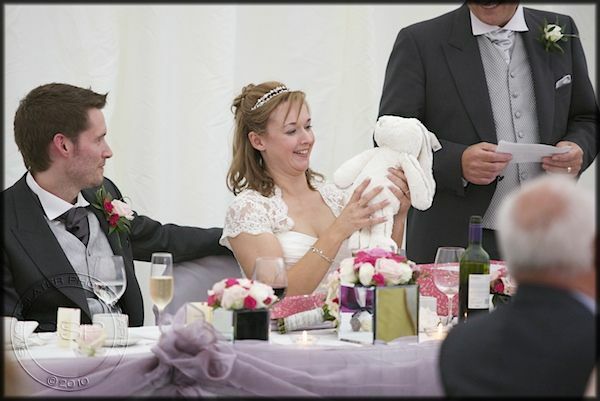 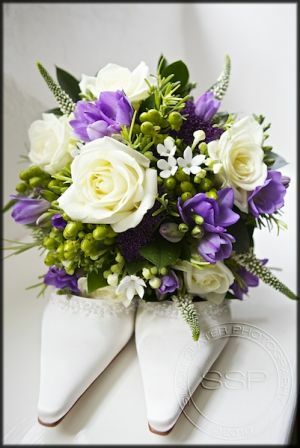 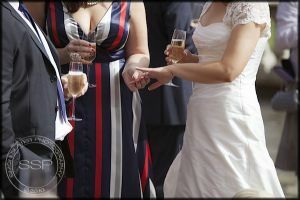 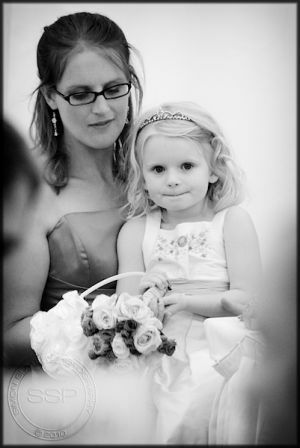 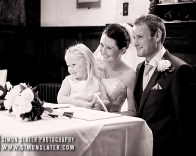 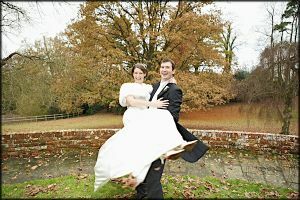 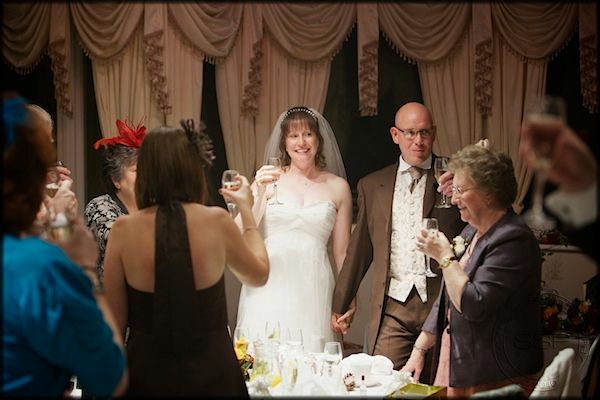 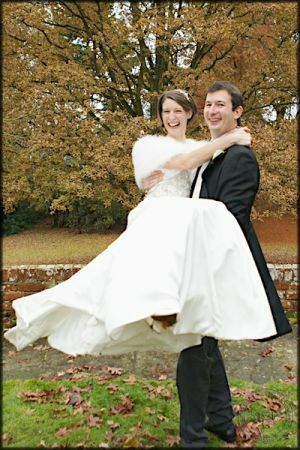 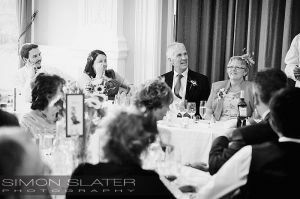 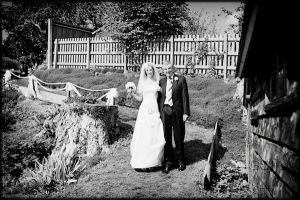 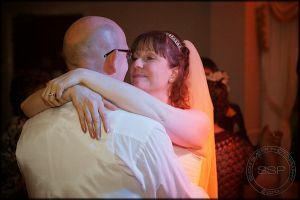 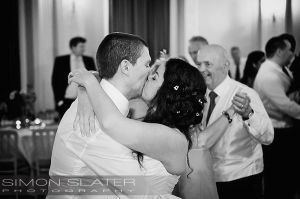 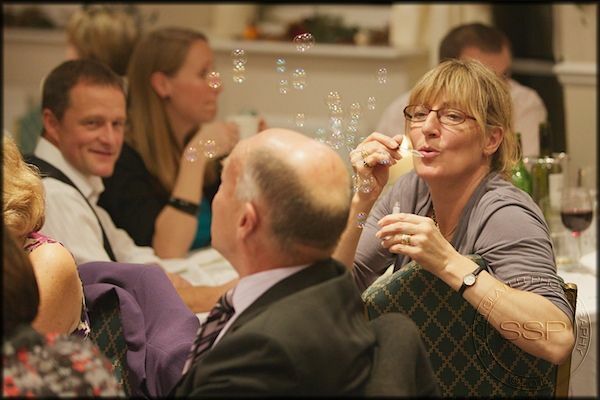 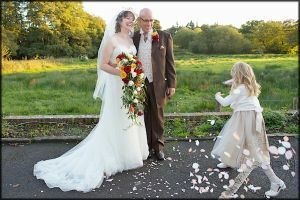 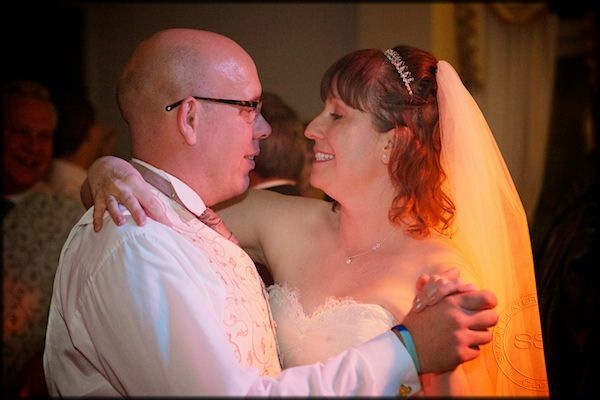 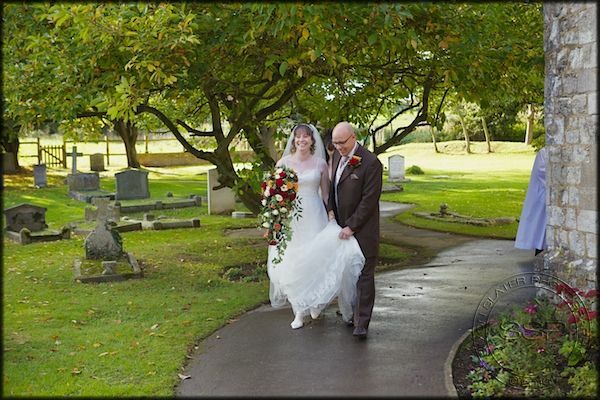 Congratulations to Elaine & Warren Burling, married on Saturday 16th October, 2010. 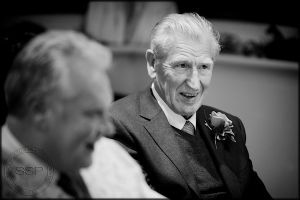 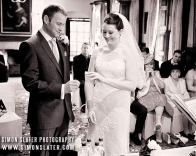 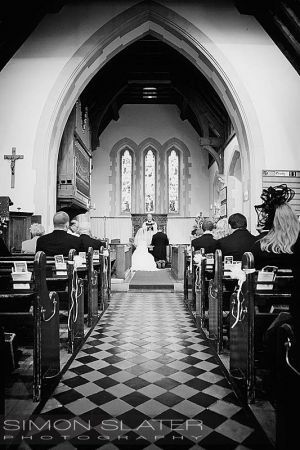 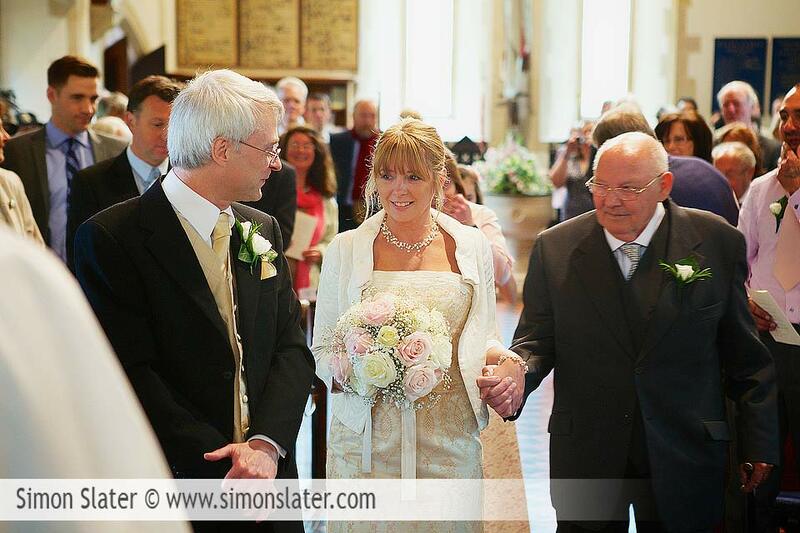 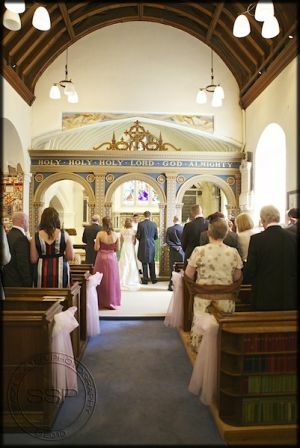 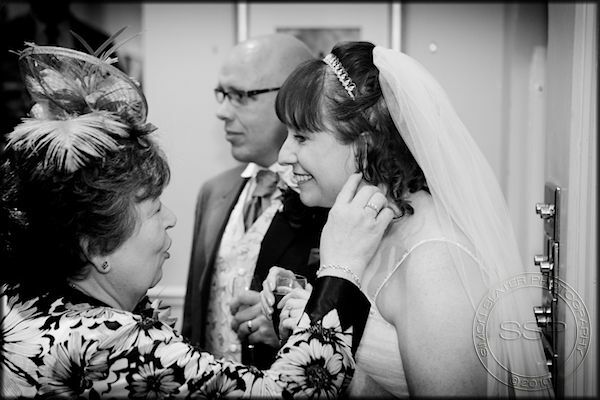 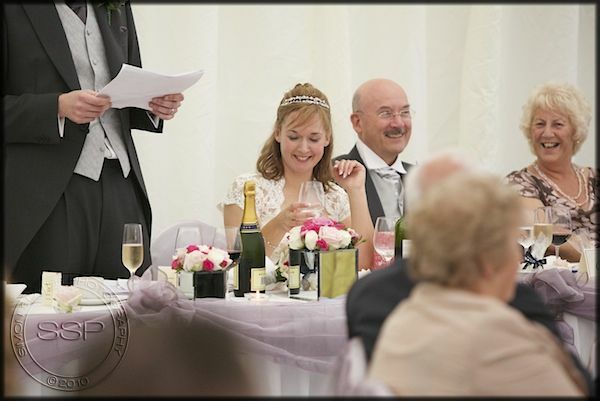 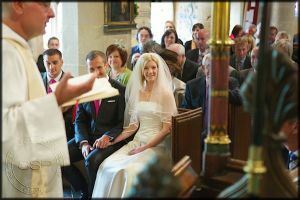 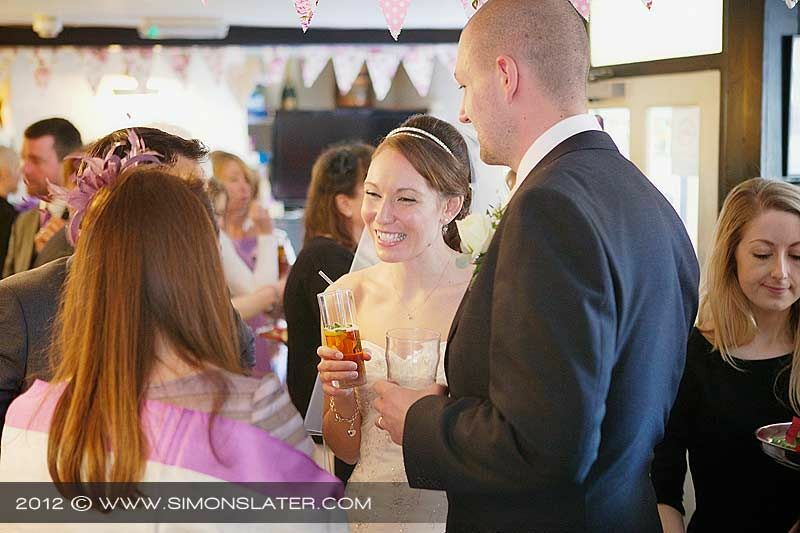 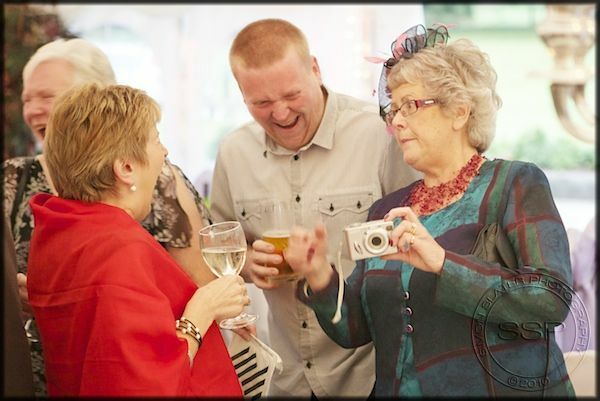 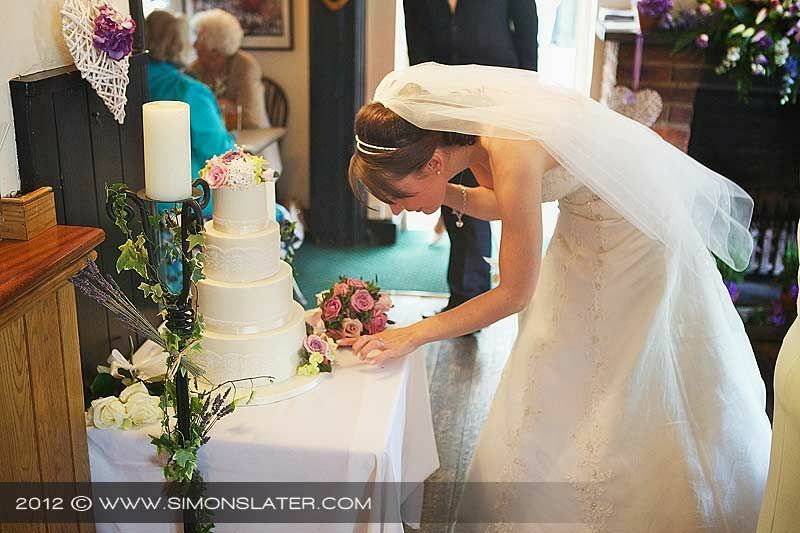 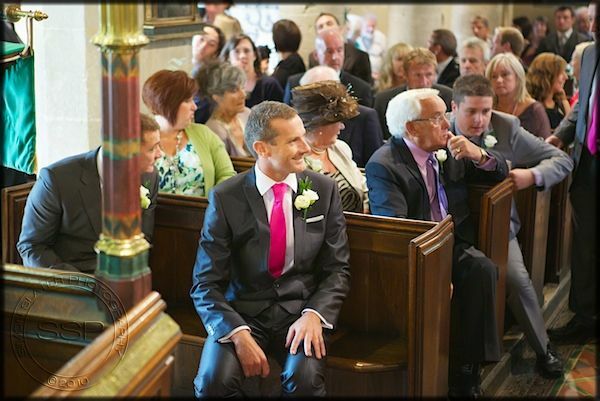 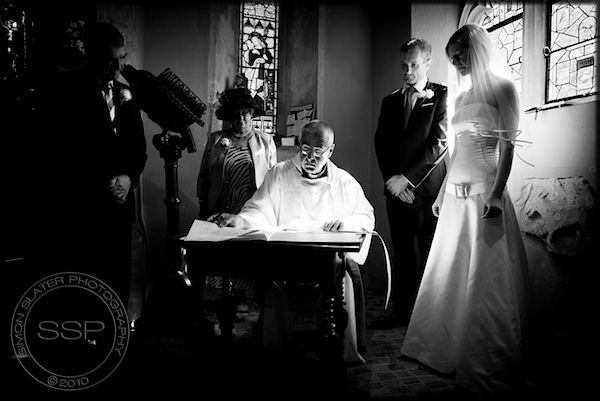 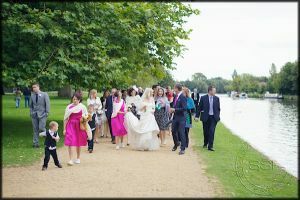 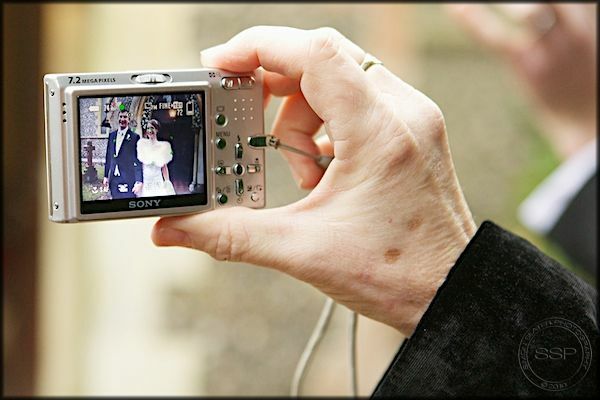 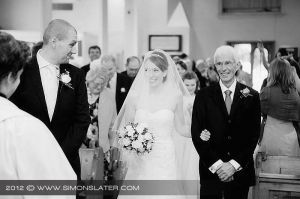 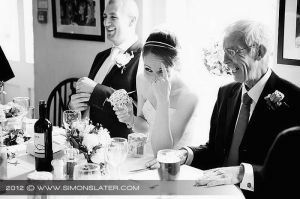 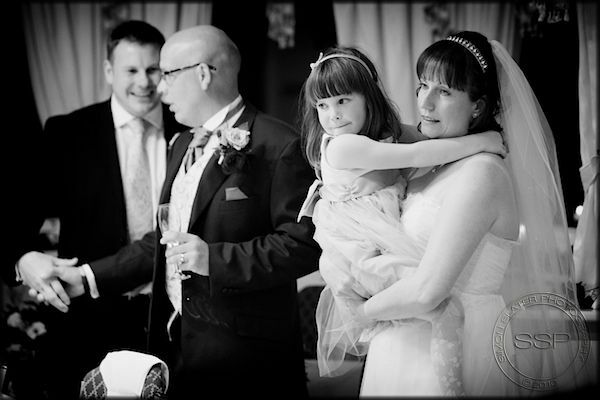 Elaine & Warren got married in St. John’s Church, Surrey and the reception was held in The Bridge at Pierrepont, Surrey for the wedding breakfast and evening celebrations. 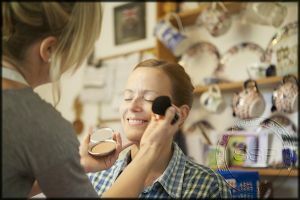 While all the guests were making their way to the reception venue it was a chance for us to drive down to Frensham Ponds to get some more photos and for the newlyweds to have a few moments to themselves. 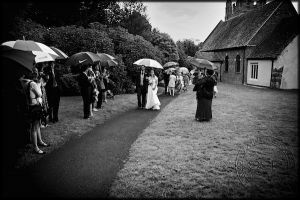 As per last weekends wedding we did unfortunately have a few down pours after the ceremony, but managed to get some of the group photos done outside as the clouds gathered. 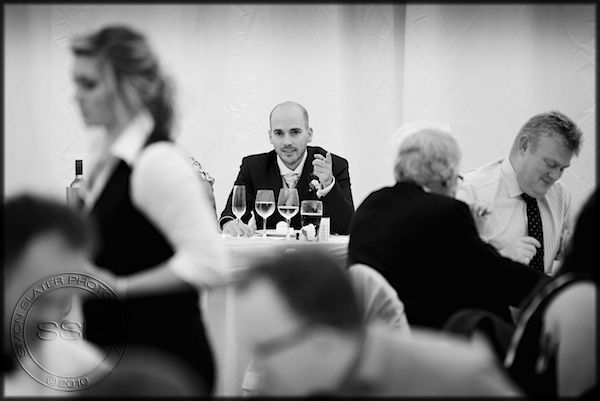 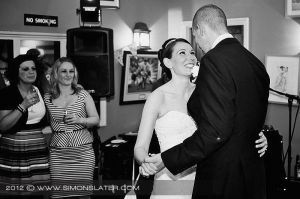 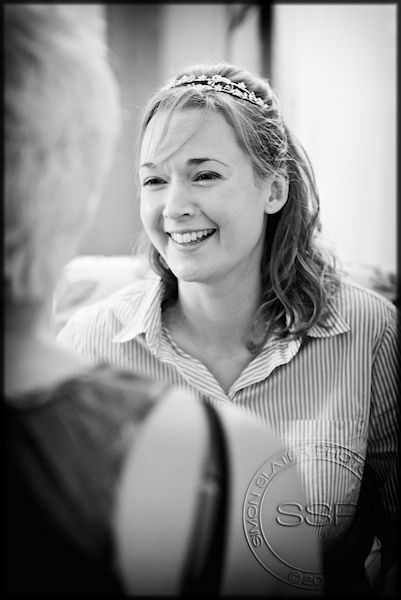 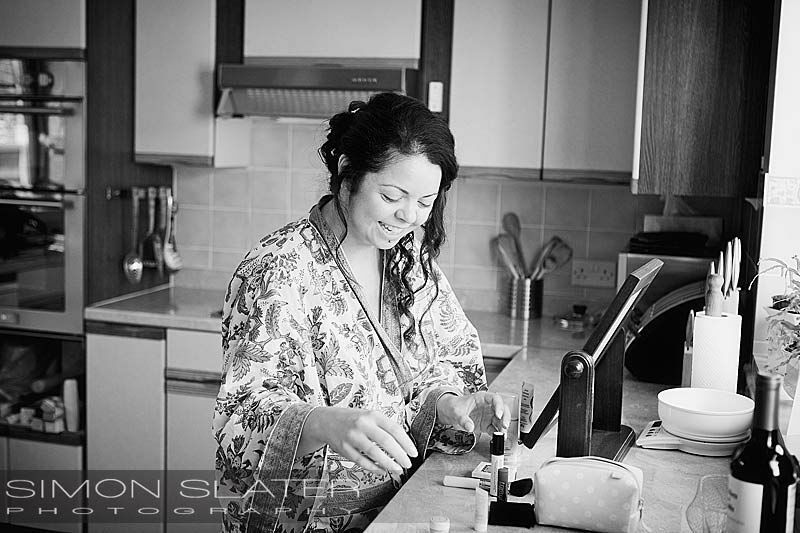 “Thank you so much for all your hard work and professionalism on our wedding day and on the build up to the big day itself. 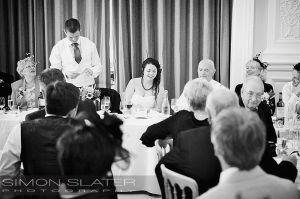 From our first meeting we were completely impressed by your previous work and by the fact you were so conscientious about everything you do. 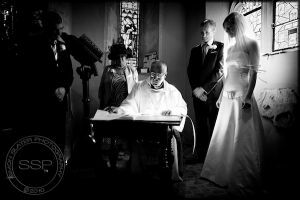 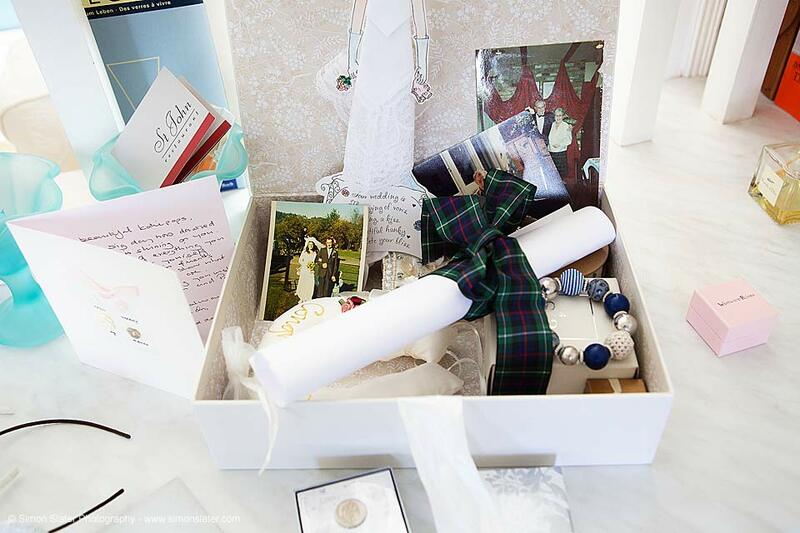 We loved the fact that you were able to provide us with the traditional style of wedding album with a modern twist that we were looking for. 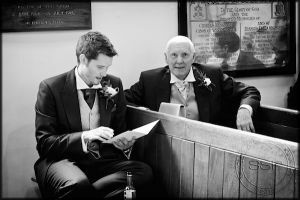 Your advice & guidance was very much appreciated and it mean’t alot to us that you listened to what we wanted and did everything you could for us. 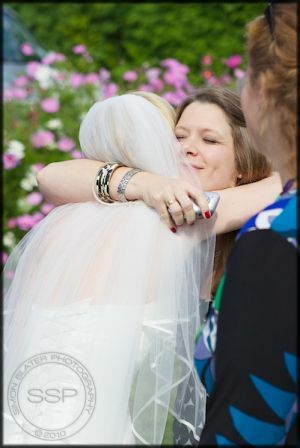 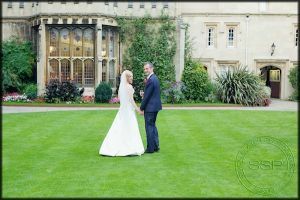 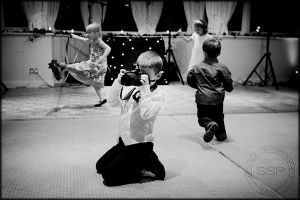 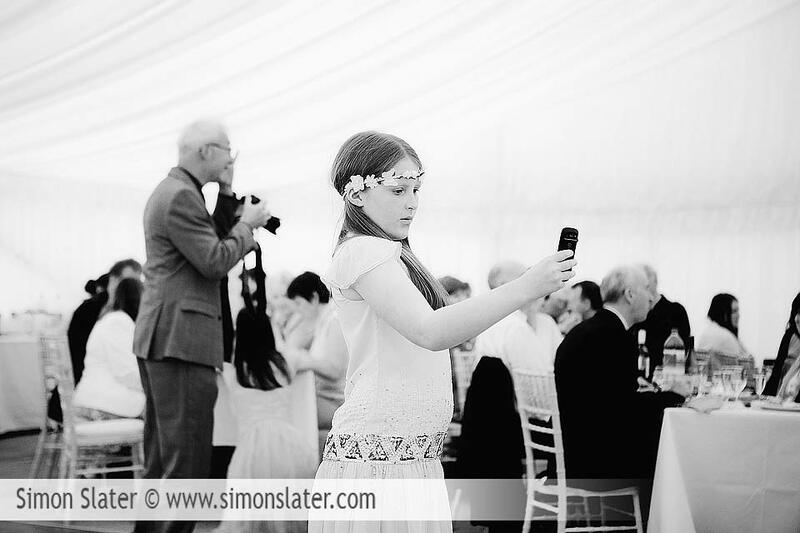 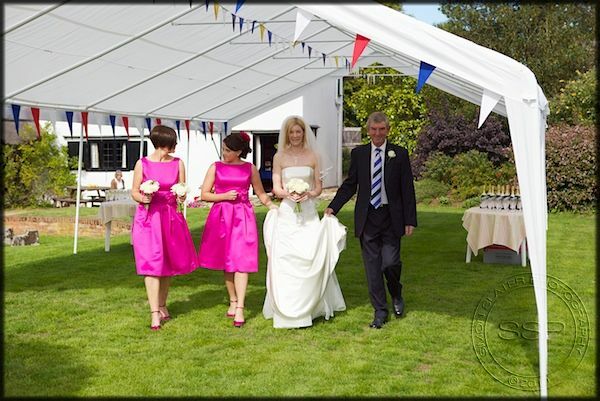 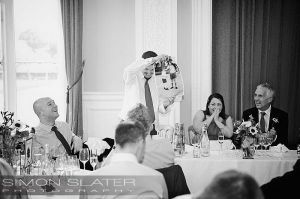 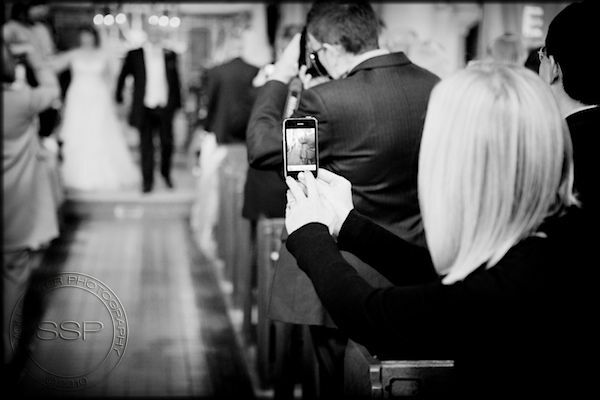 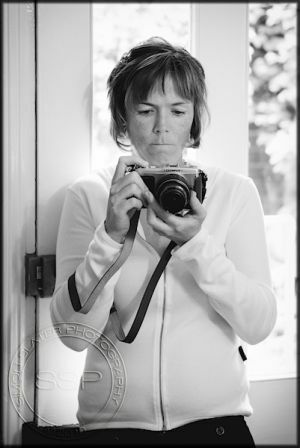 We’ll never forget all your hard work on the day itself & we were amazed at all the fantastic photos you captured for us. 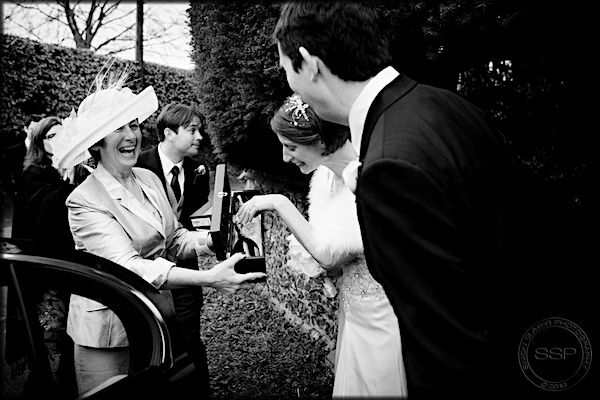 As for the album itself, we have had nothing but ooohs & aaahs from friends and family. We all think it is absolutely stunning!! 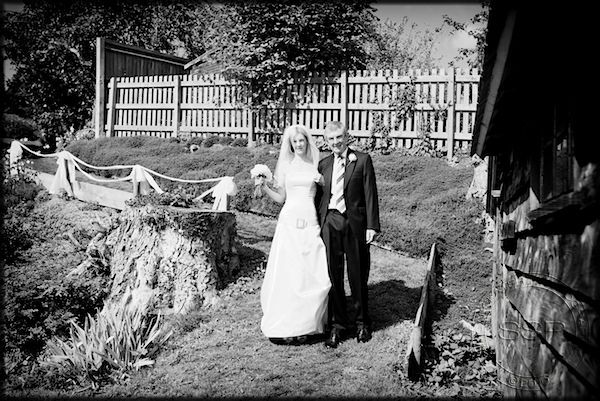 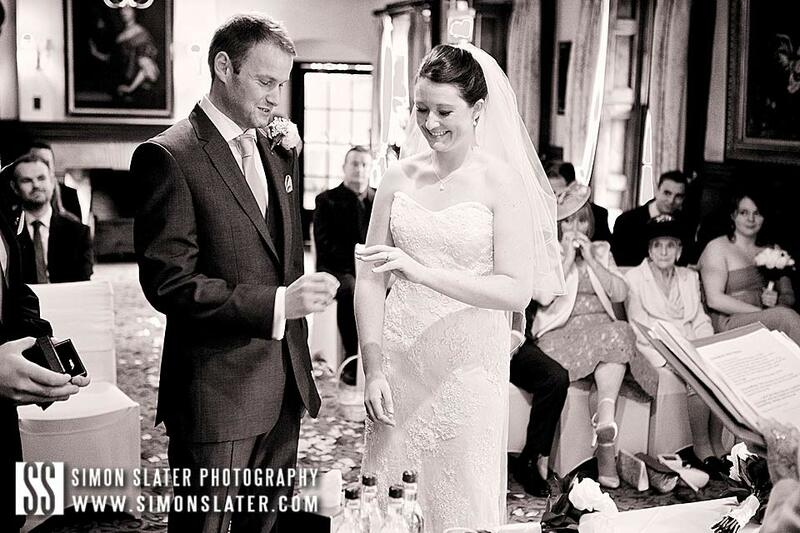 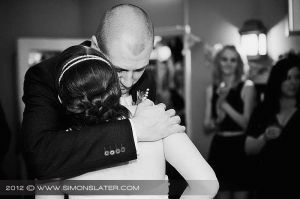 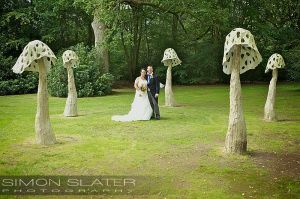 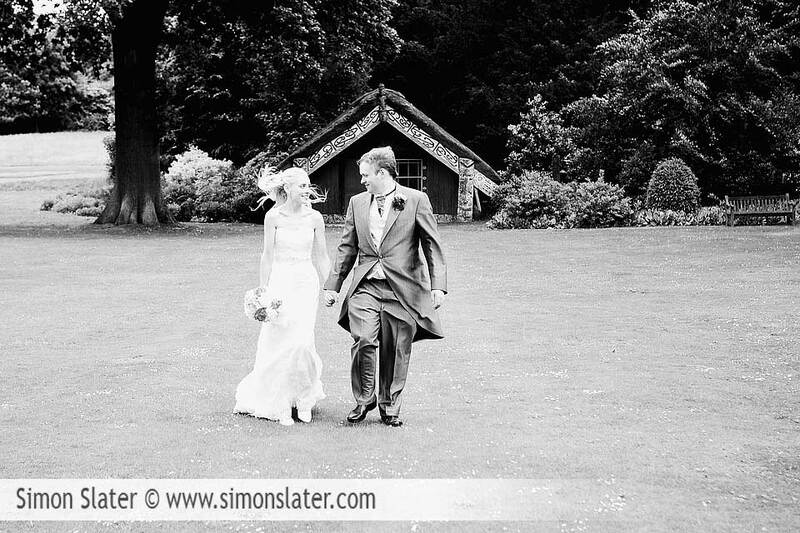 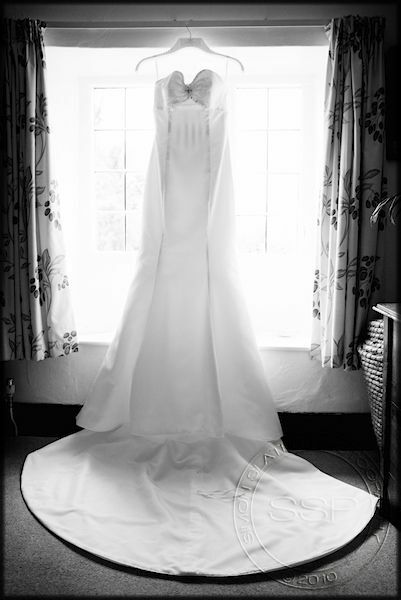 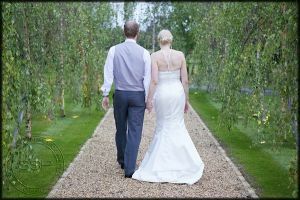 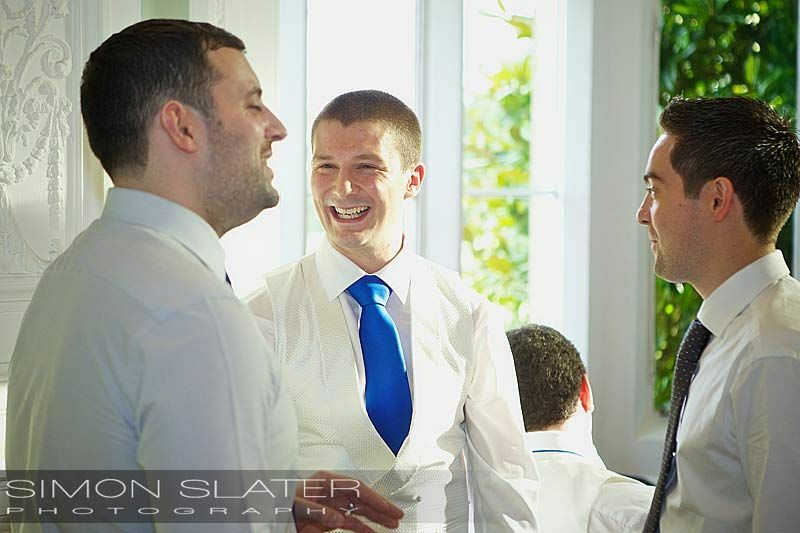 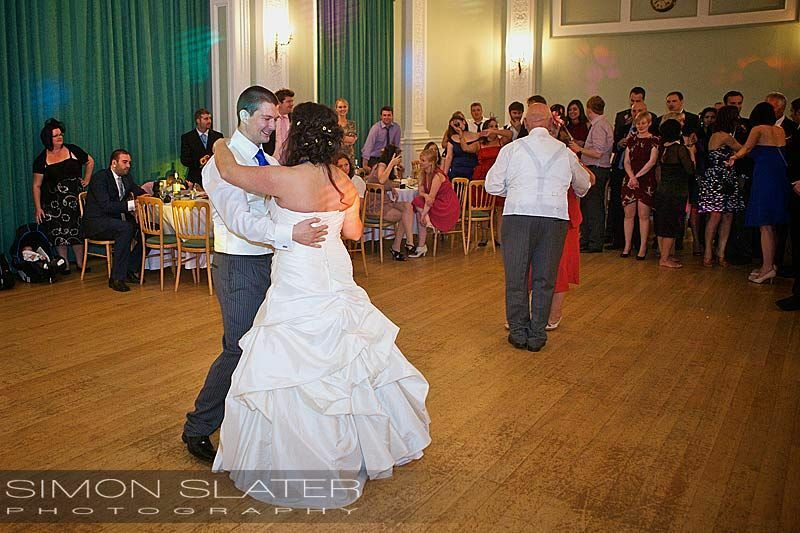 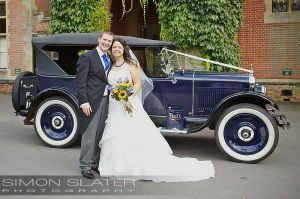 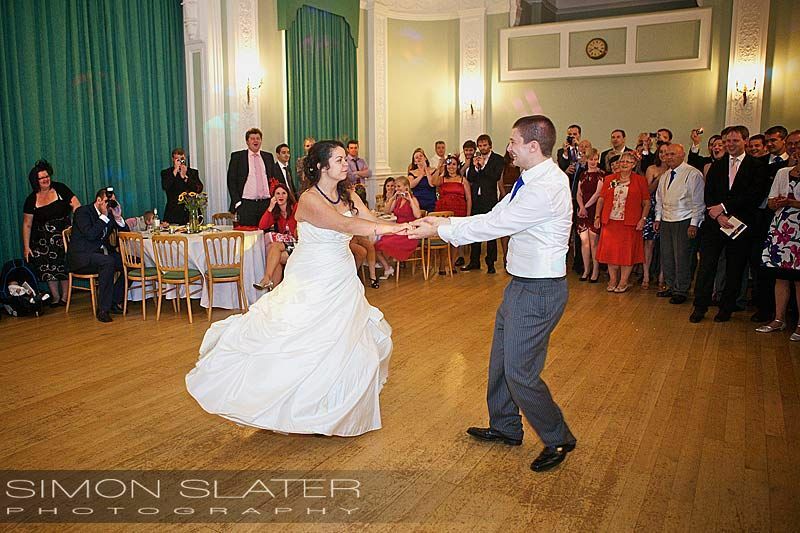 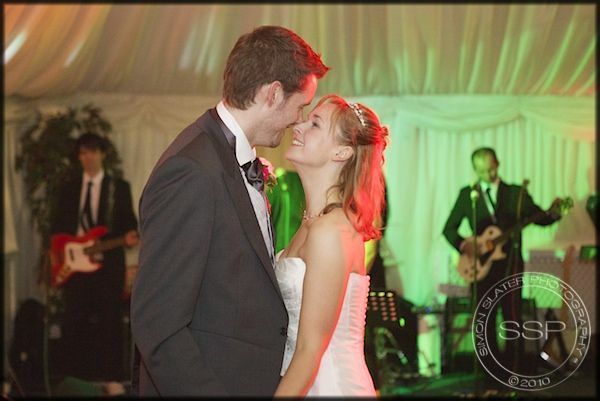 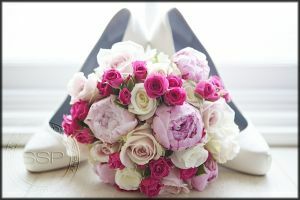 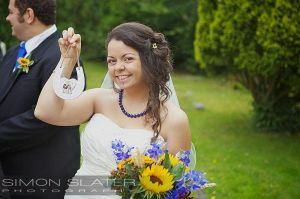 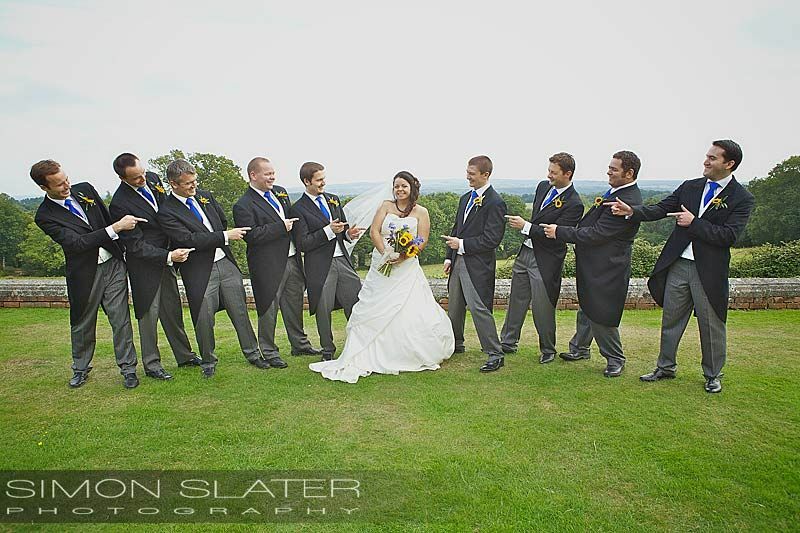 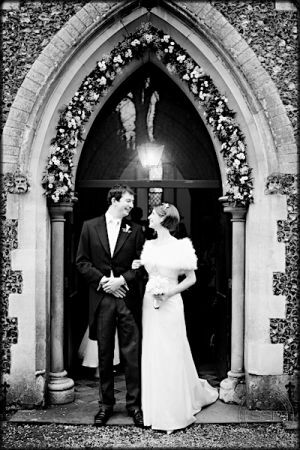 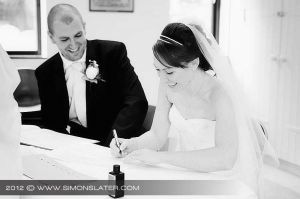 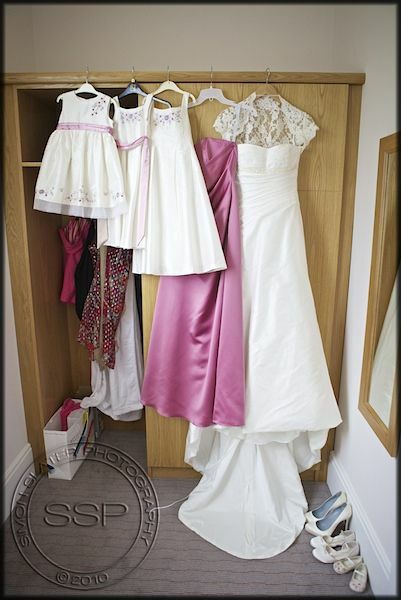 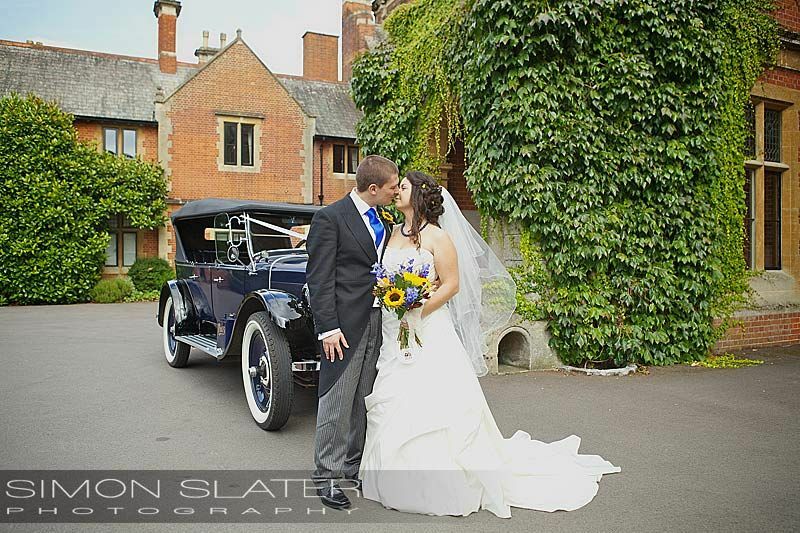 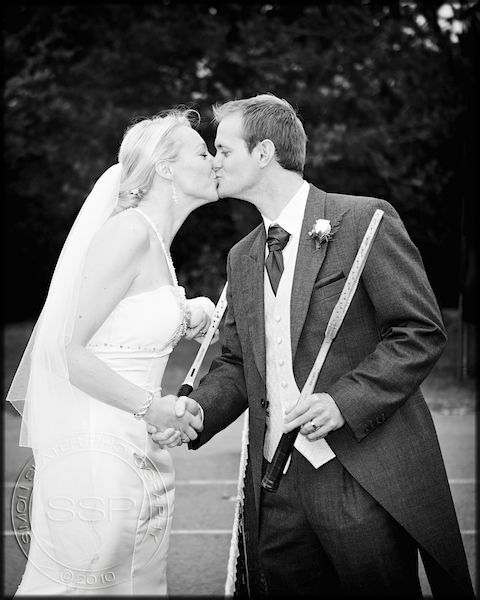 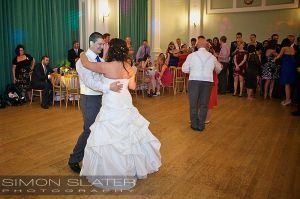 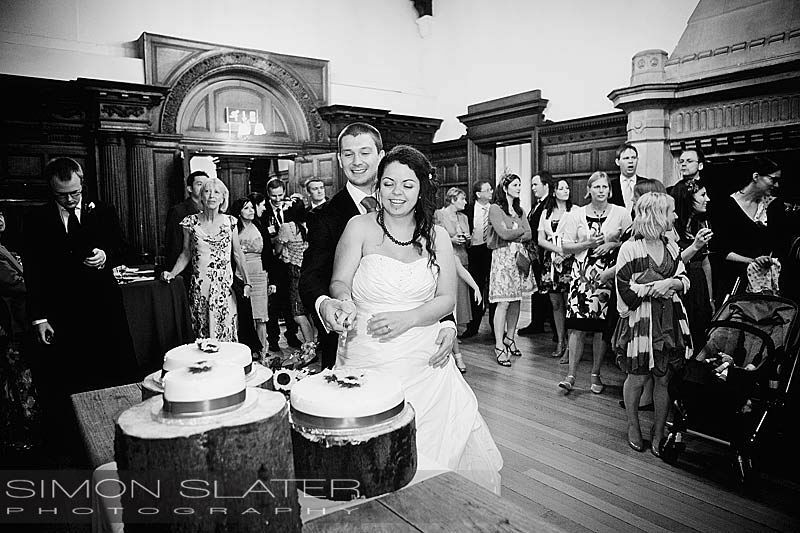 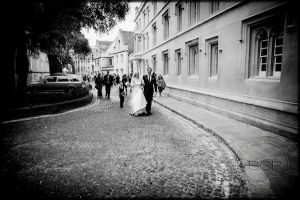 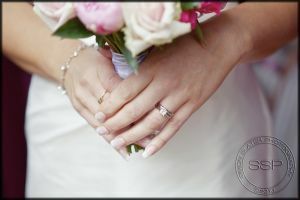 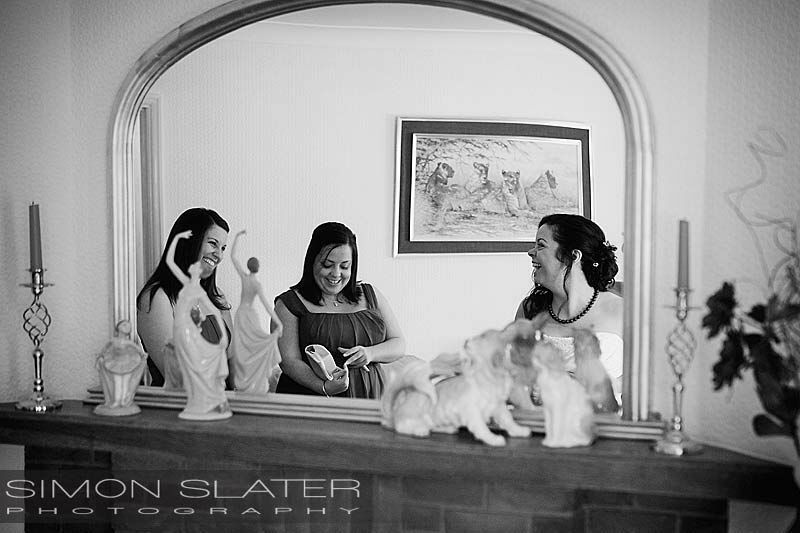 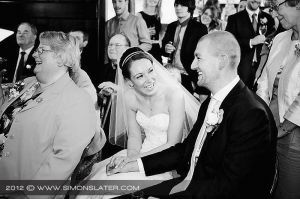 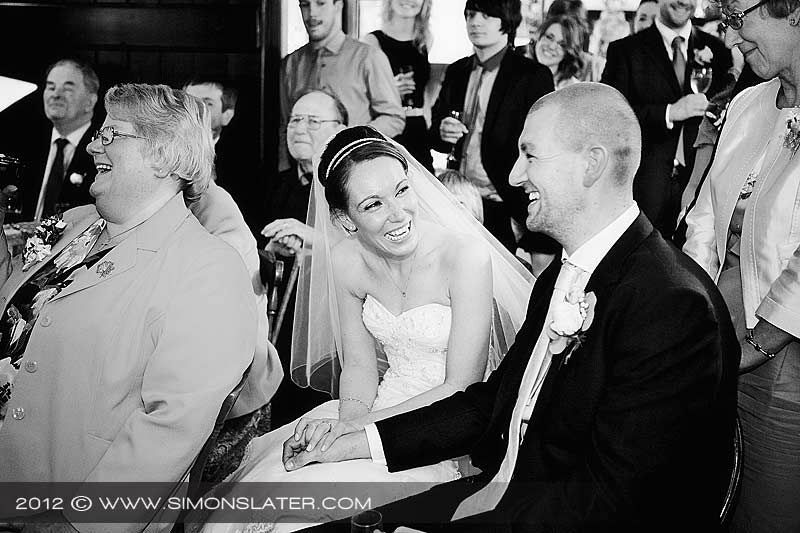 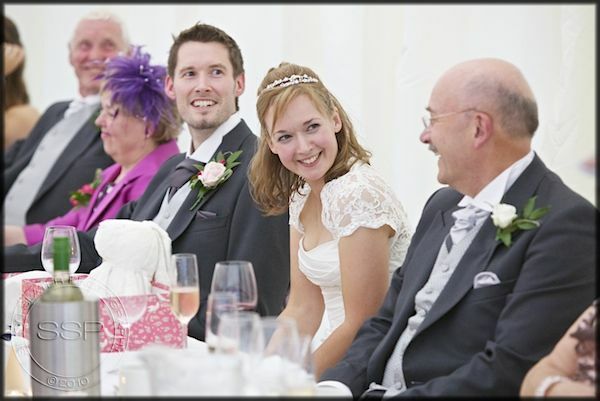 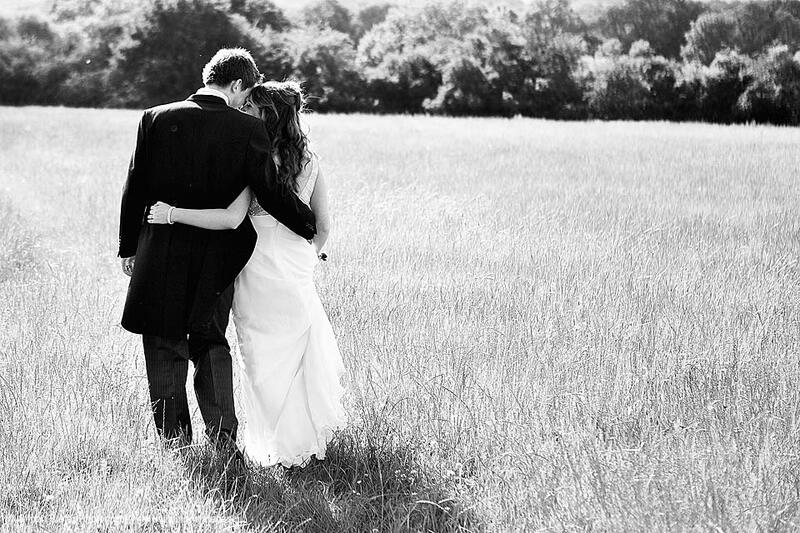 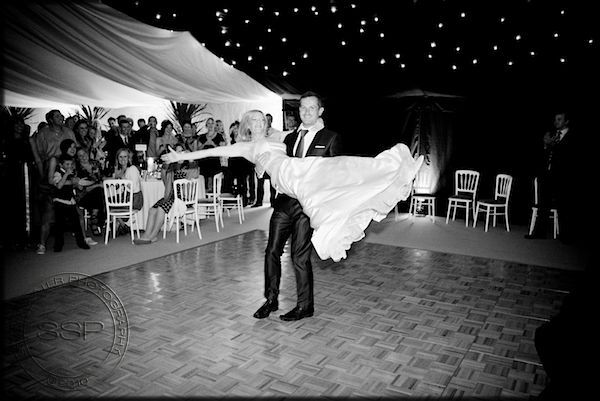 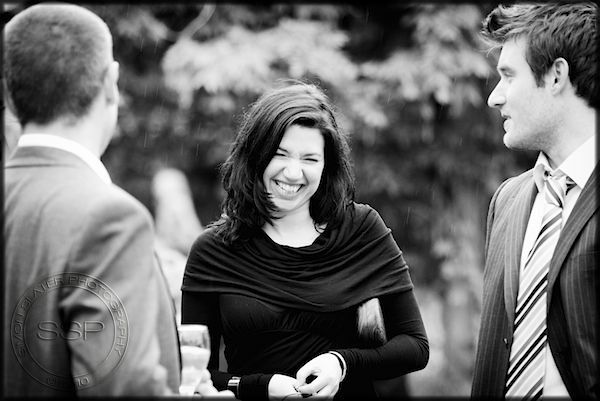 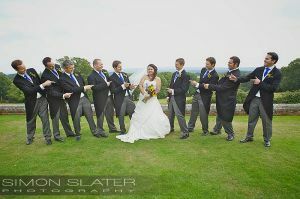 Congratulations to Lauren & Dan Marriott, married on Saturday 02nd October, 2010. 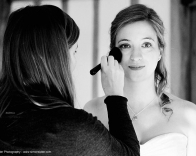 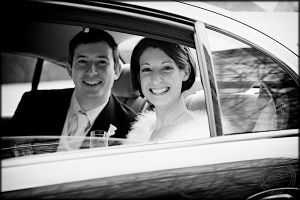 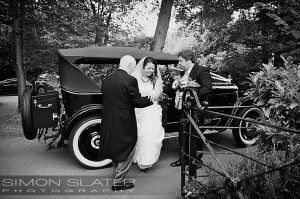 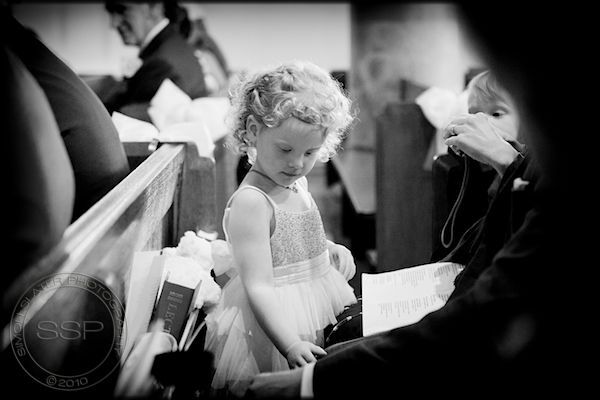 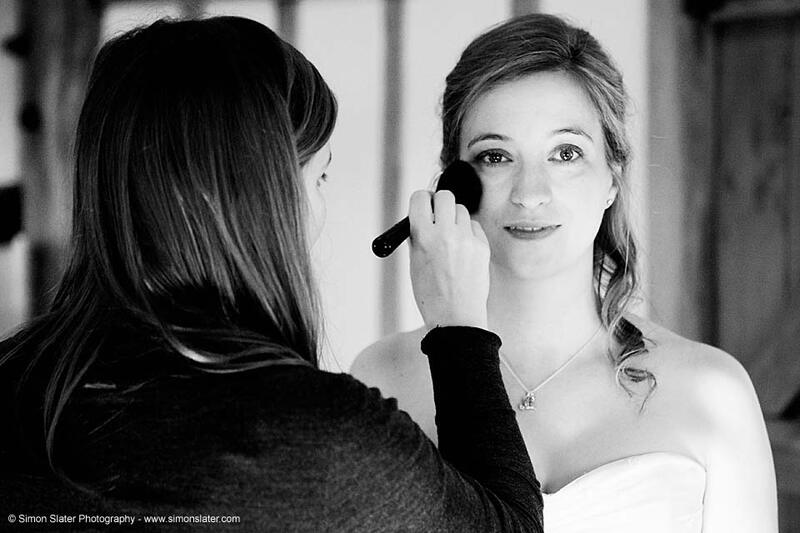 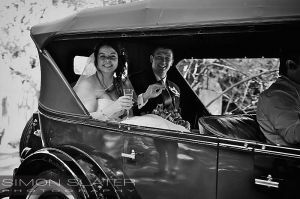 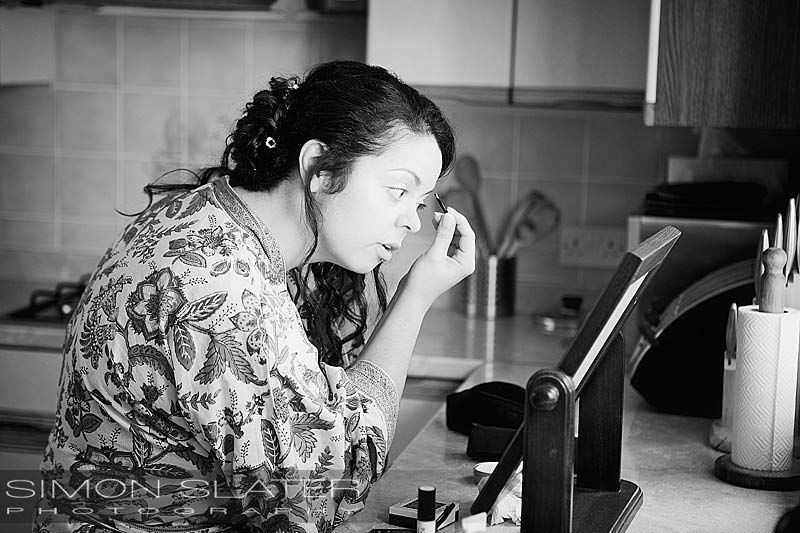 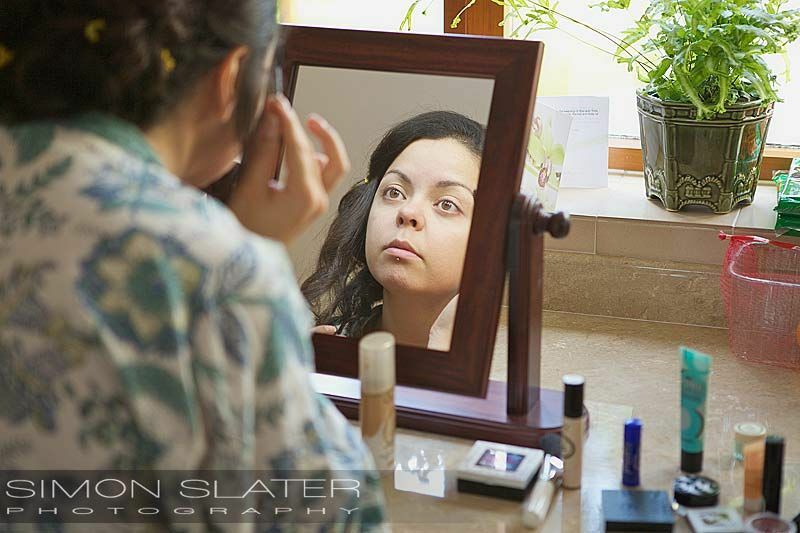 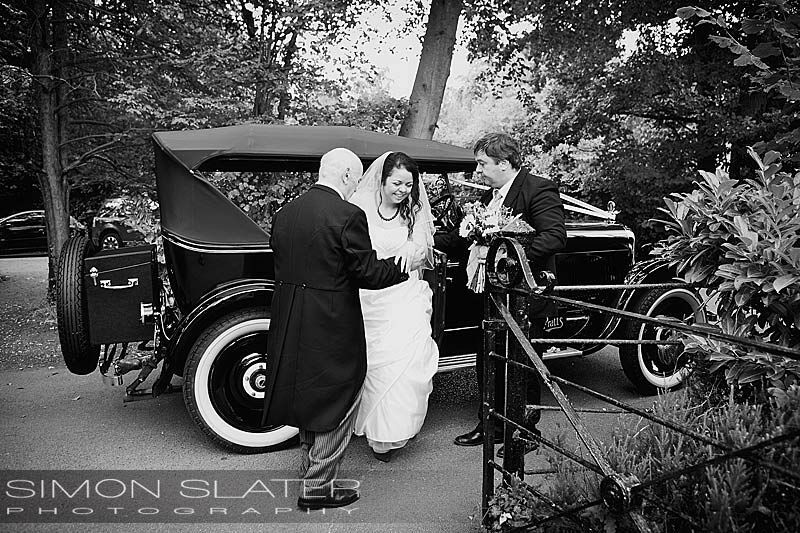 Lauren got ready at her parents house and was transported with her father to St. Mary’s Church in Upton Grey in a classic 1925 Oakland wedding car. 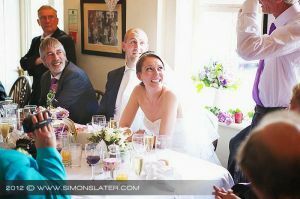 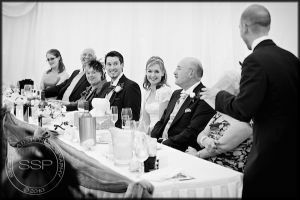 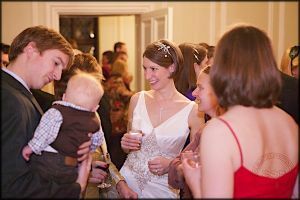 After the wedding ceremony, the whole wedding party made their way to the stunning Cain Manor venue set overlooking the Hampshire countryside. 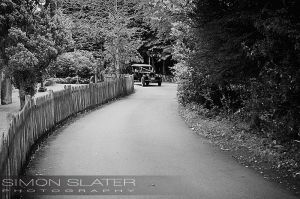 Unfortunately the weather and some local road closures meant a wetter and slightly more cross country route to Cain Manor. 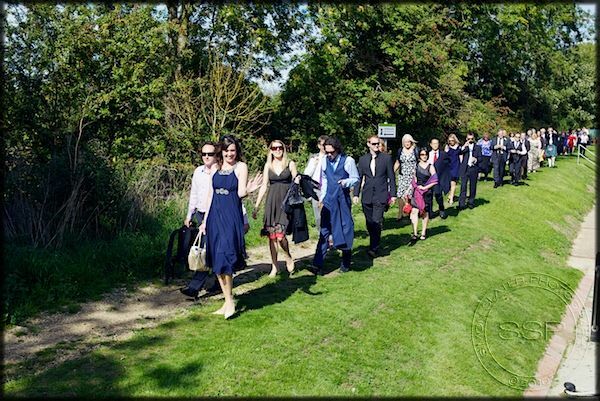 However, everyone arrived safely, although in a more staggered time frame. We also managed to get outside for a few photos in between down pours, a fun day was had by all. 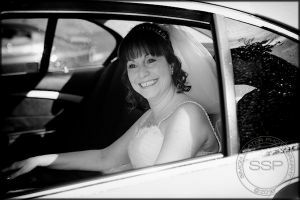 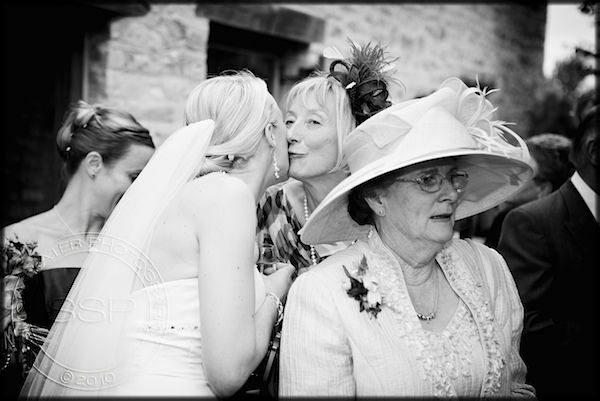 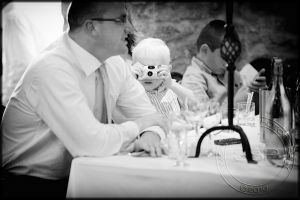 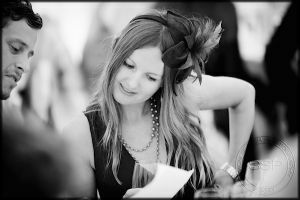 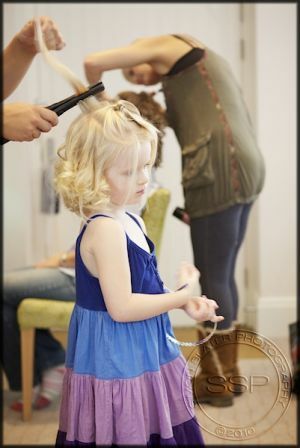 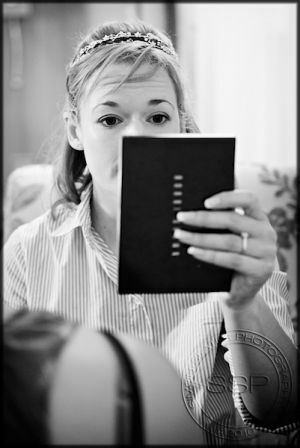 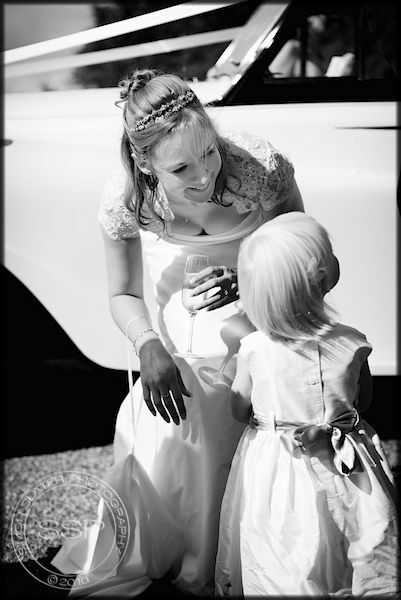 Sarah got ready with her bridesmaid, flower girls and friends at Oakley Hall and was driven to the church in a beautiful black & white classic wedding car. 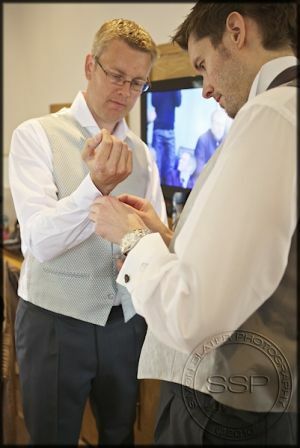 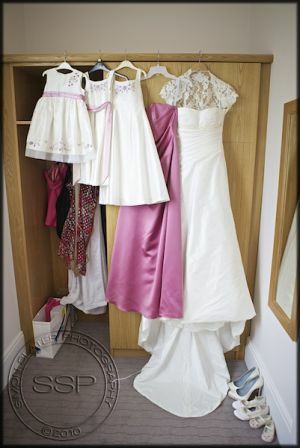 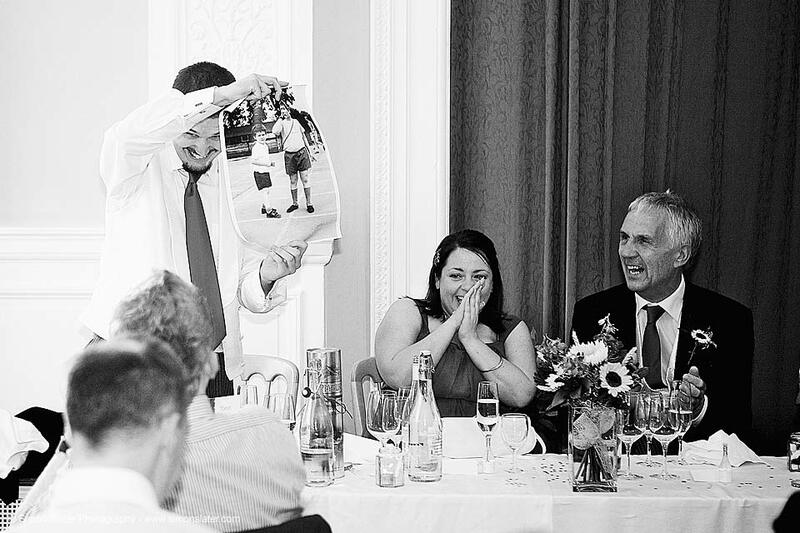 Richard got ready in an adjacent room with his best man, father and ushers. 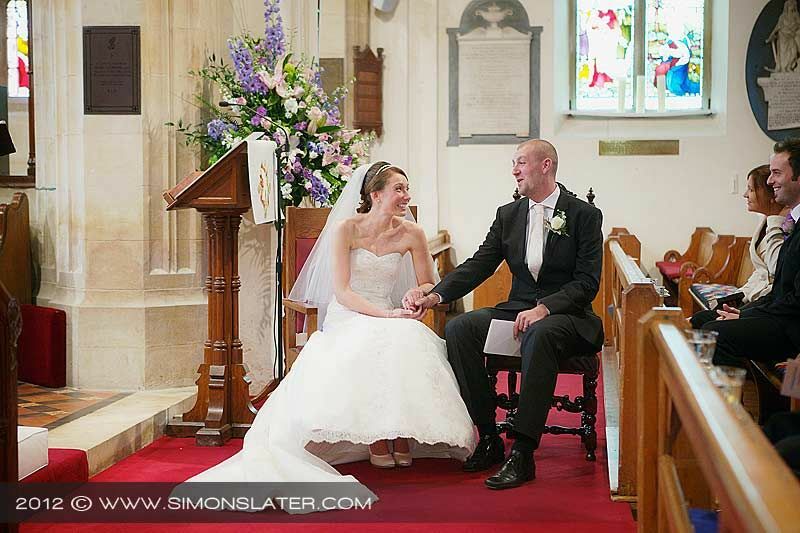 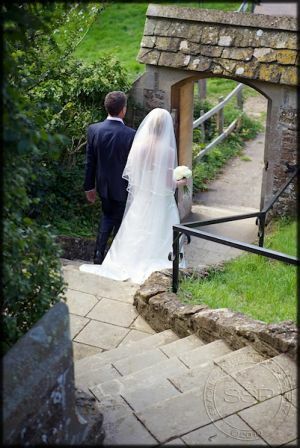 Sarah and Richard were then married in St. Mary’s Church on Saturday 14th August at 1400hrs. 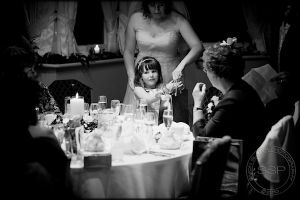 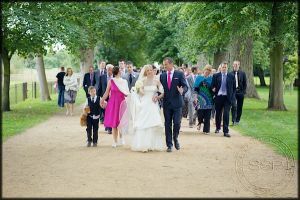 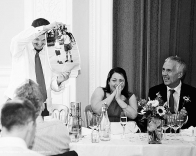 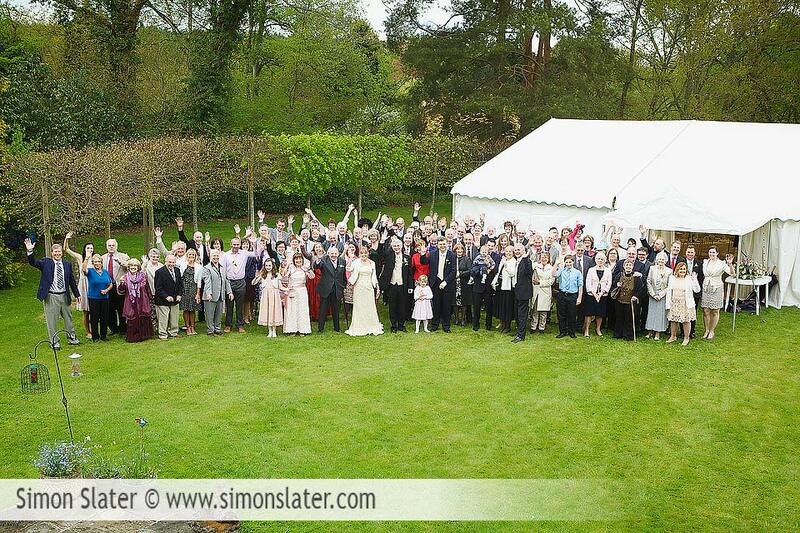 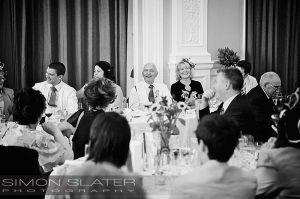 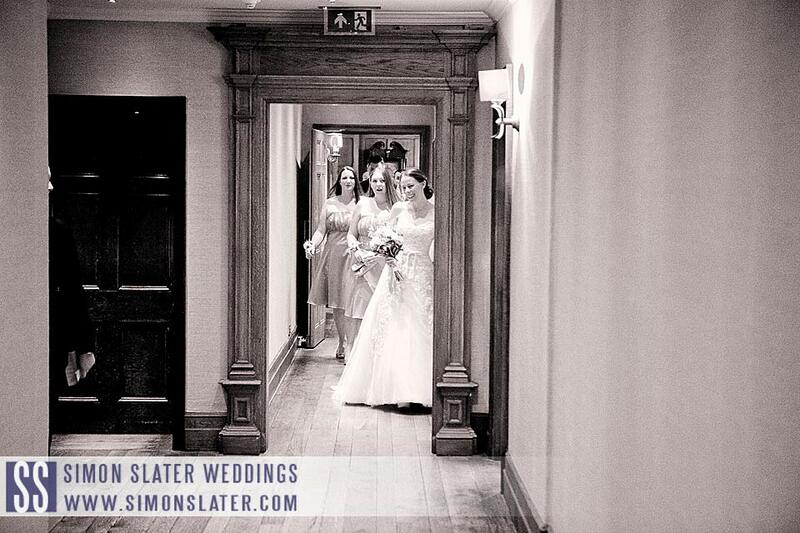 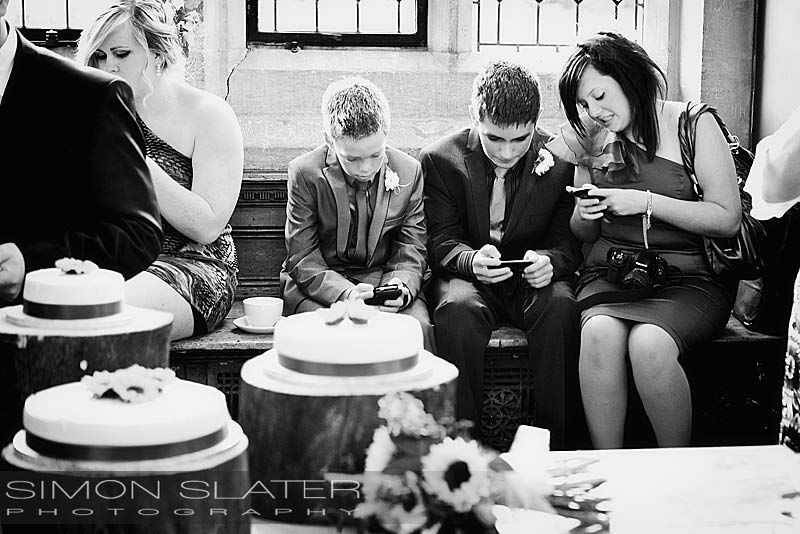 The wedding party then returned to Oakley Hall for the wedding breakfast and evening celebrations. 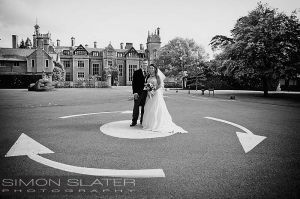 The weather held out long enough to get all the group photos in the lovely grounds at Oakley Hall before the wedding breakfast. The heavens then duly opened for the rest of the evening.